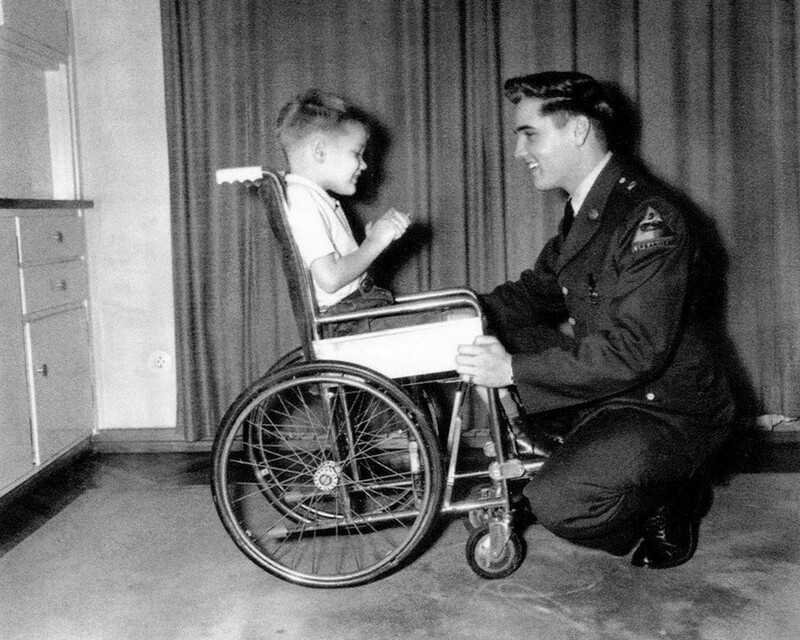 Elvis Presley was a great humanitarian. 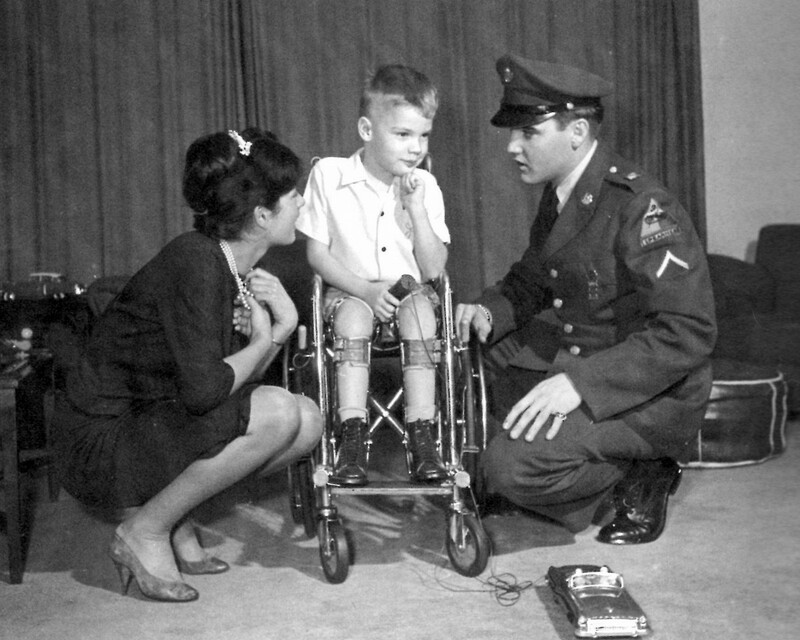 Throughout his life he showed a lot of concern for the welfare of others. 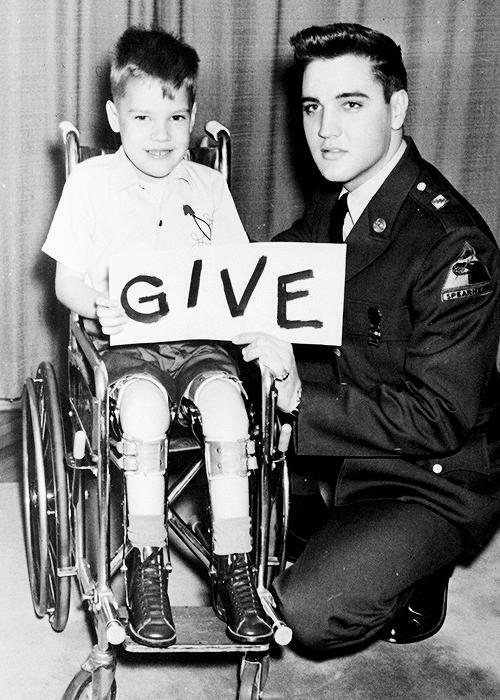 Elvis actively supported many good causes in any way thinkable: from Photo Shoots and Charity Concerts, to Donations (of all kinds! ), and anything in between. 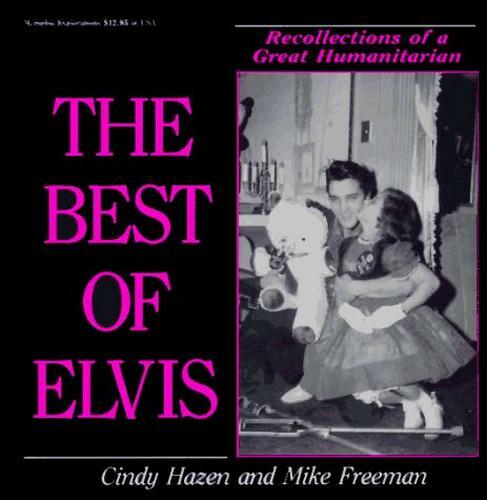 While researching this subject, I was amazed to find out how often Elvis had actually been involved in charity work, right from the start of his career, and I could have easily filled a dozen pages with this. 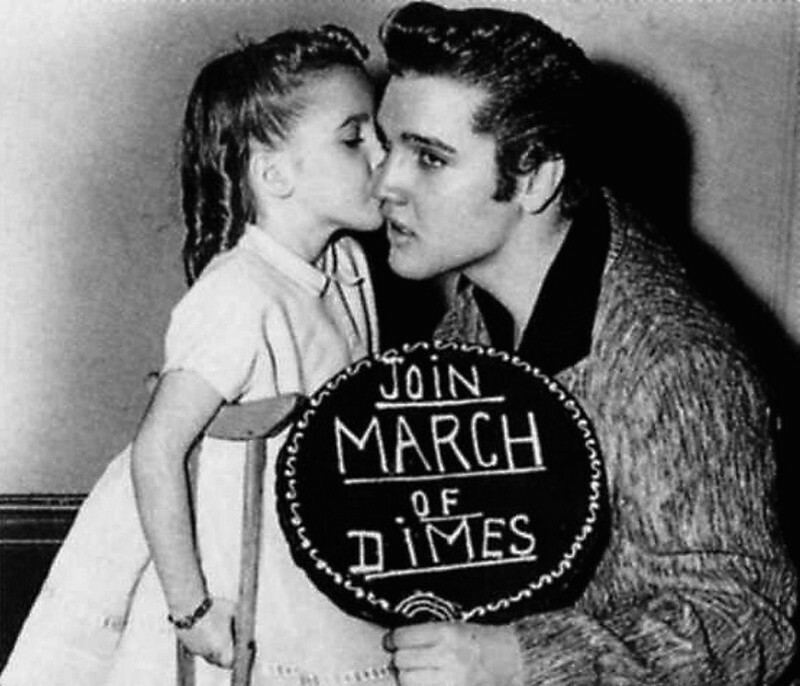 But in this article we will focus on only a small portion of Elvis’ charity work in the 1950’s, particularly on the connection between Elvis and March Of Dimes. 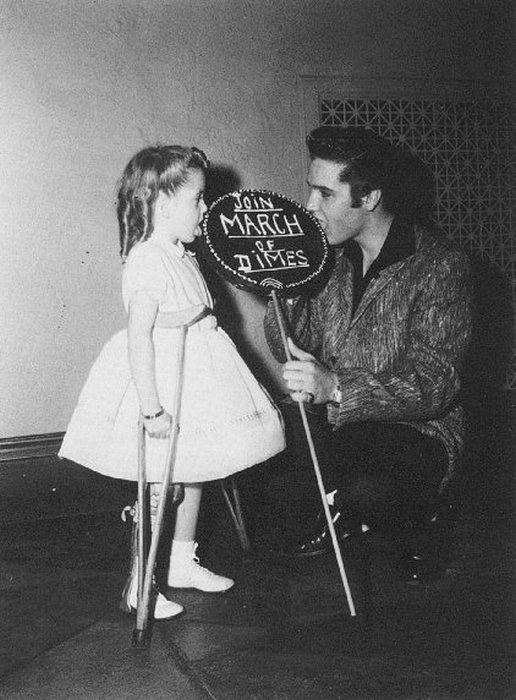 Here we have a picture of Elvis backstage at the Fair Park Auditorium with some children of the March Of Dimes. 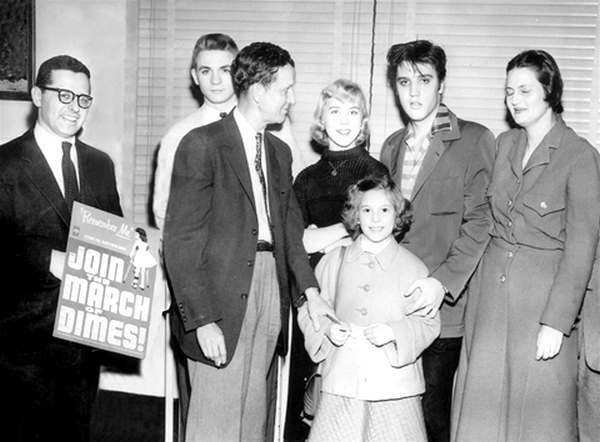 The gentleman to the left is Faron Young who shared the bill with Elvis that day. 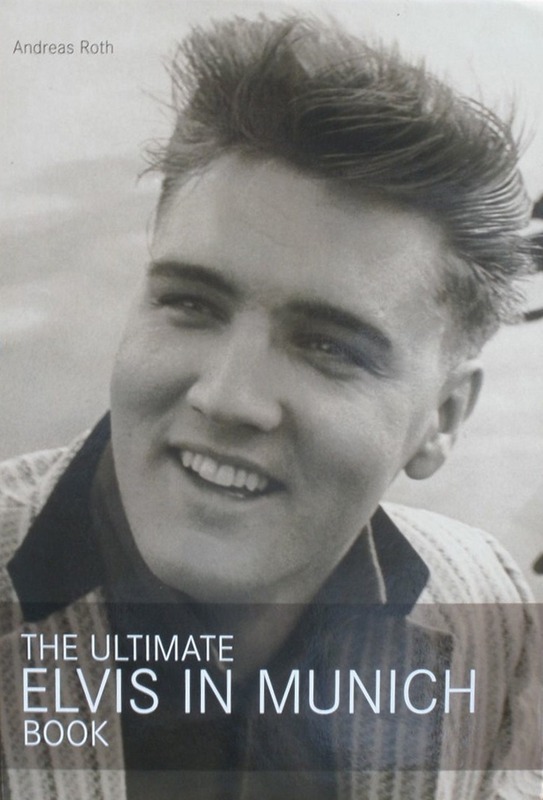 In 1955, Elvis had already performed five times in the hometown of Buddy Holly, and during that same year a fairly unknown Buddy had opened a show for Elvis, Scotty and Bill. 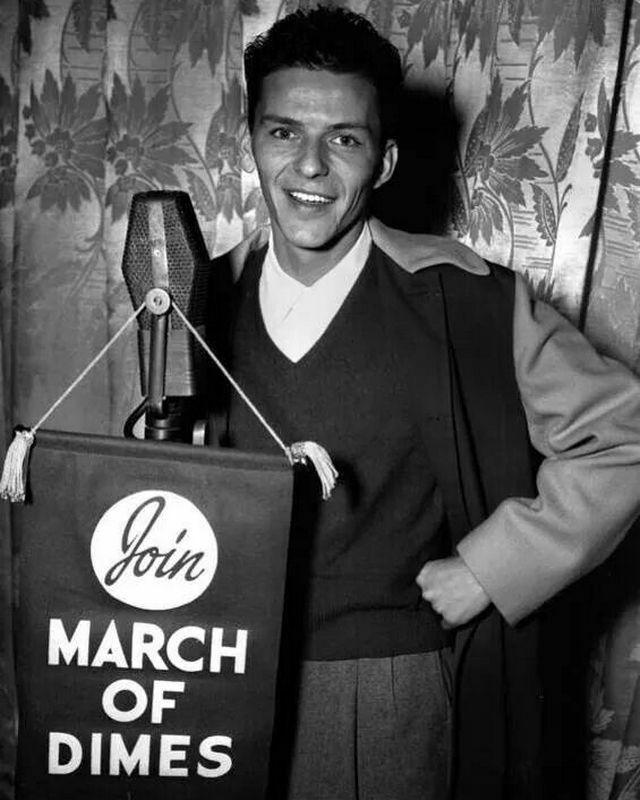 By April 1956, Buddy Holly had made a name for himself locally though he still did not have a record out, while Elvis at this point had become a TV sensation and major RCA Victor recording artist with a Number One song to his credit. 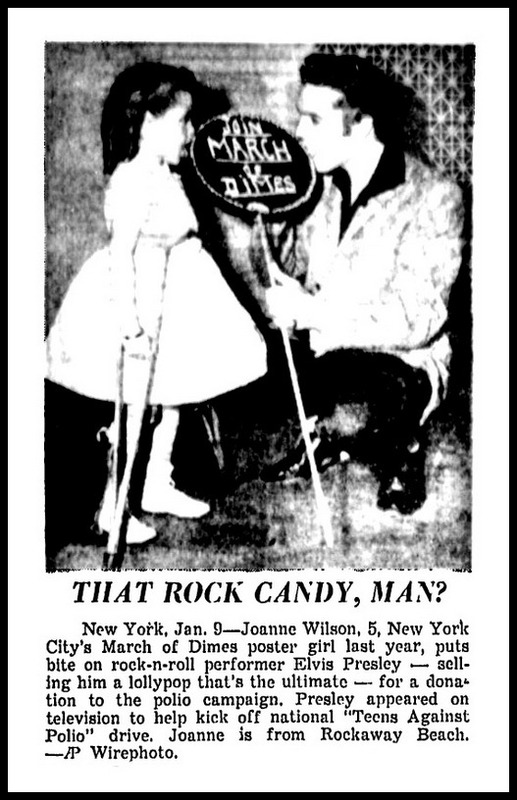 On April 10th, Buddy Holly once again opened for Elvis, even though he did not receive any credit for this in the Lubbock newspaper advertisement (to the left). 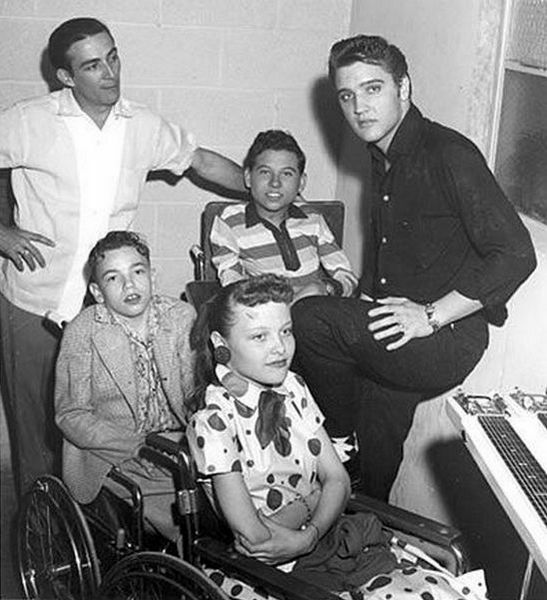 On July 4th, 1956, Elvis Presley headlined a CHARITY CONCERT at Russwood Park in Memphis. 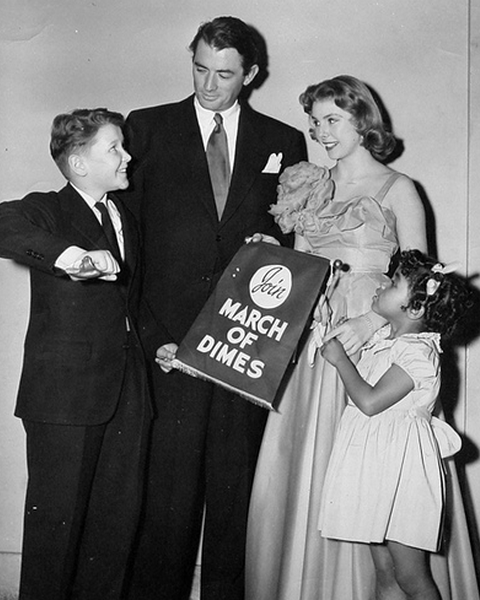 All proceeds were donated to the Cynthia Milk Fund and the Variety Club’s Home For Convalescent Children. 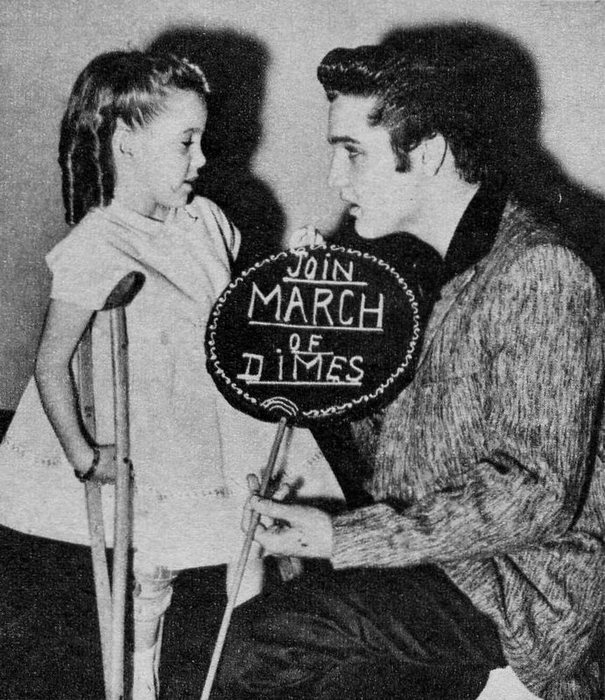 Mrs. Mincey and her 12 year old daughter Ellen were looking forward to see Elvis perform that evening, but tragically enough they were injured in a car accident and forced to spend the night in a hospital bed instead. 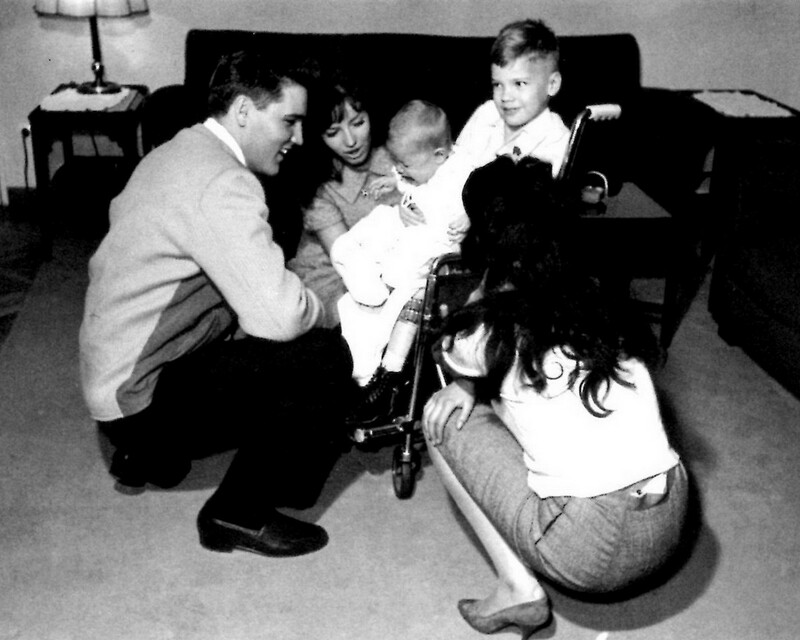 Elvis heard of their accident and decided to pay the unlucky mother and child a surprise visit at St. Joseph’s Hospital. 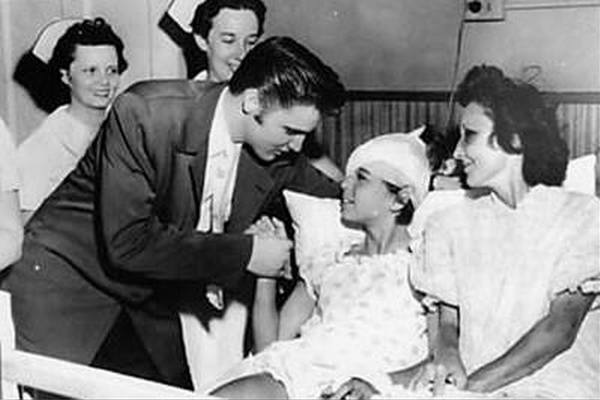 According to next day’s Memphis newspaper report, Elvis spent 20 minutes with the pretty bruised up ladies. 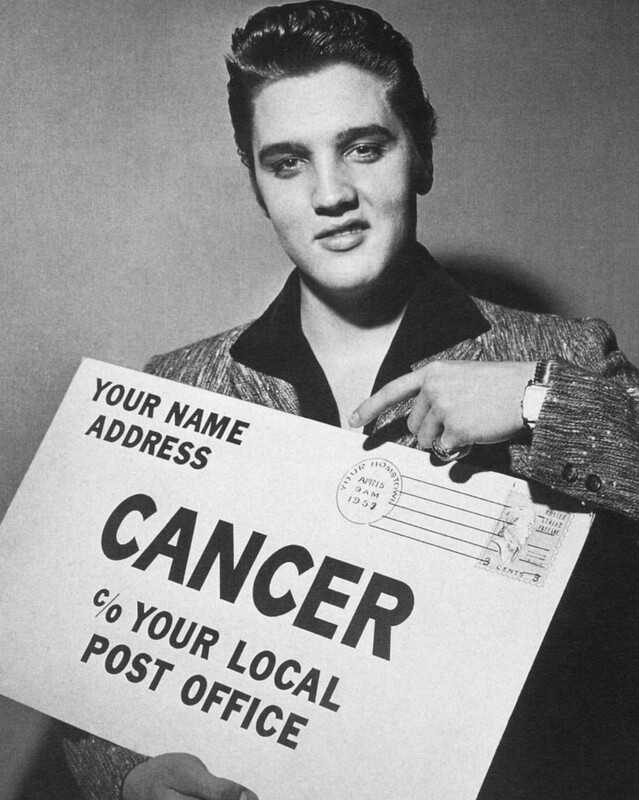 The 28th of October was quite a hectic day for Elvis. 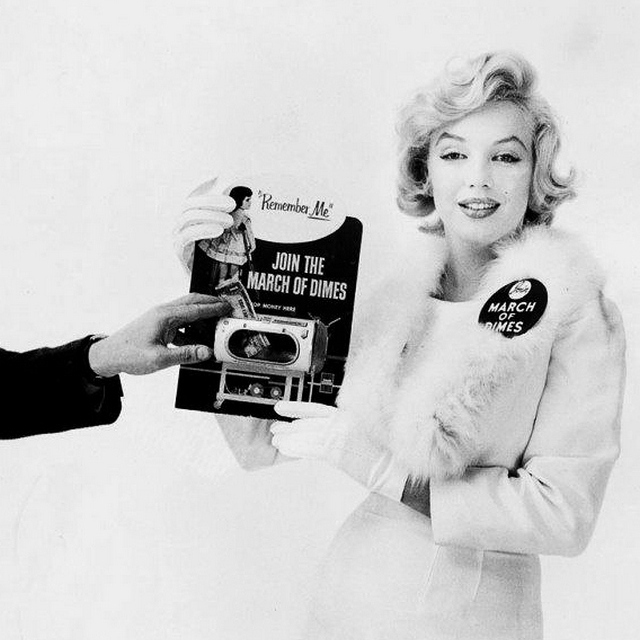 He appeared on The Ed Sullivan Show for the second time, and on Times Square a huge cut-out of him was revealed to promote the upcoming PREMIERE OF LOVE ME TENDER . 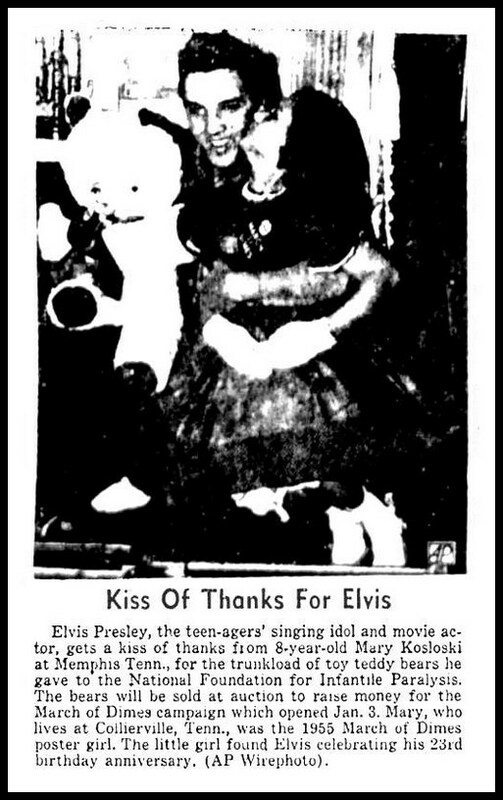 Elvis caused quite a media circus with his presence in New York City as huge crowds were drawn to these happenings. 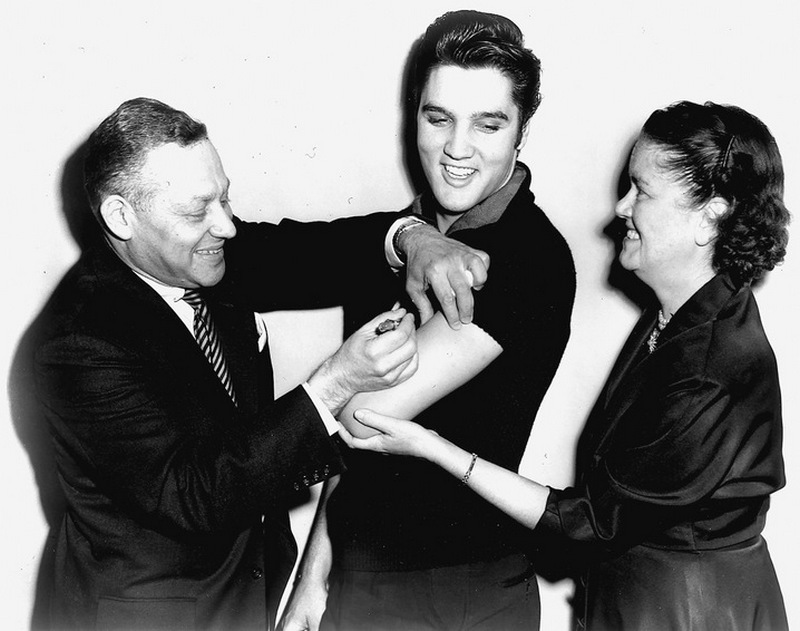 In the midst of rehearsing for the Sullivan Show, Elvis found time to take the Salk Vaccine polio shot. This was done in a perfectly staged setting in front of photographers and other members of the press. “Singer Sets An Example For Teen-Agers”. 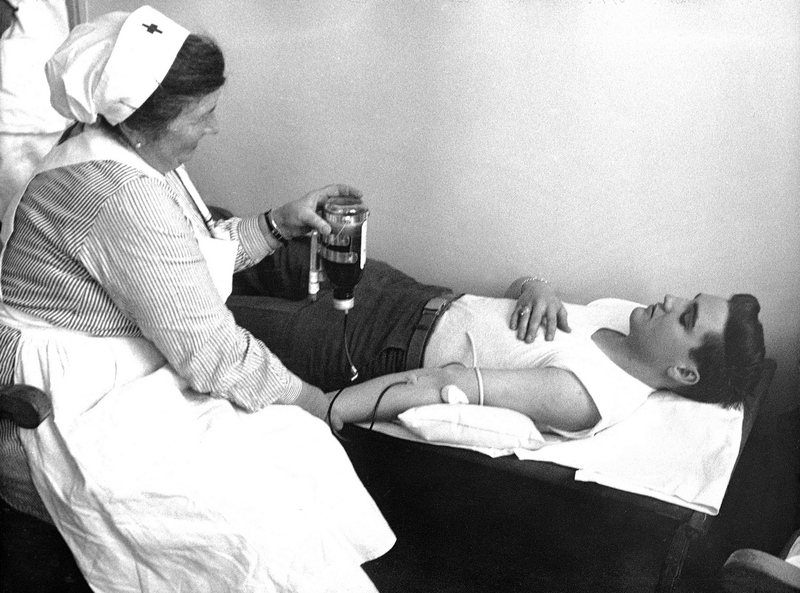 Dr. Harold Fuerst can be seen giving the shot, while the lady on the right is Dr. Leona Baumgartner, New York’s Health Commisioner. 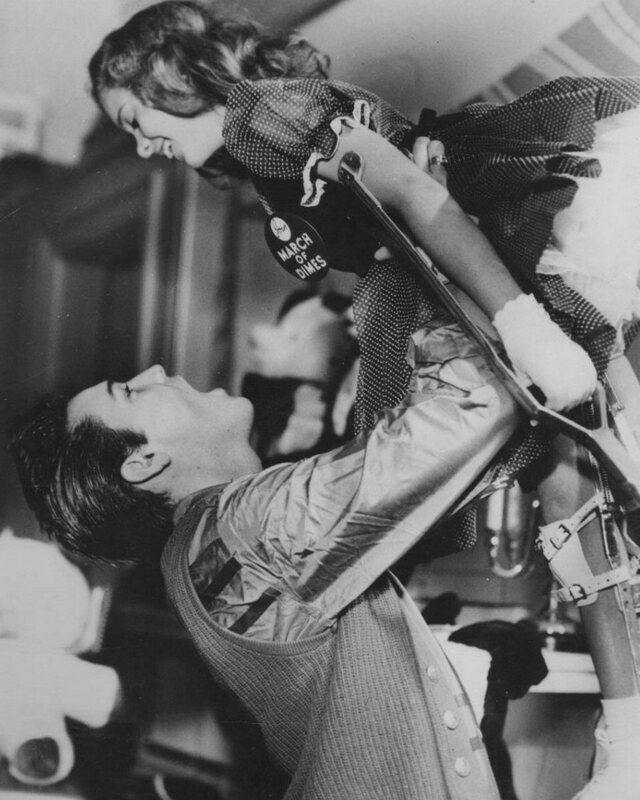 On this day Elvis appeared on the Hayride for the very last time. Space in front of the stage was cleared in order to present some patients from the local Hospital with the best seats in the house. 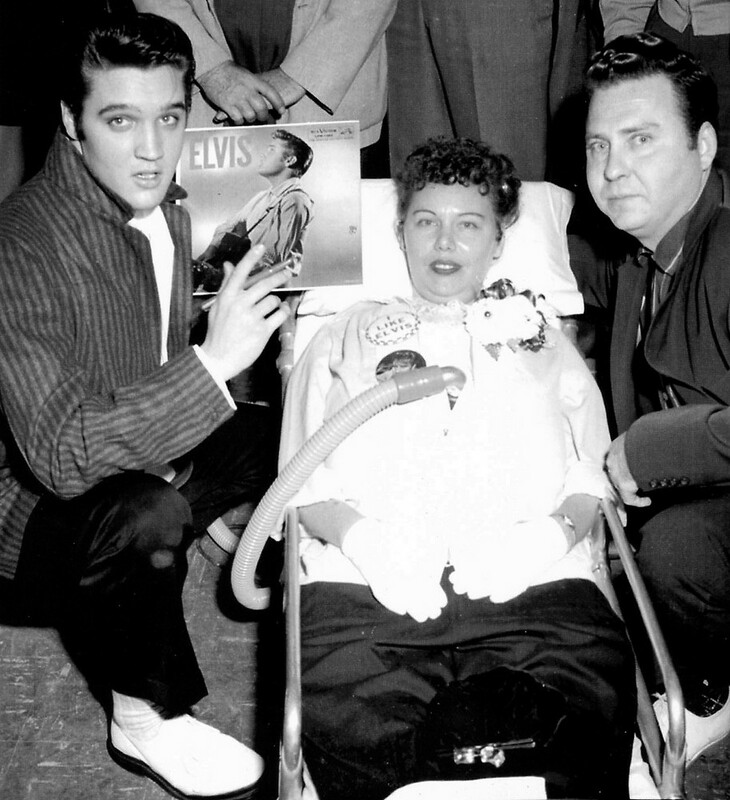 Elvis also posed with his fans and signed some of his records. 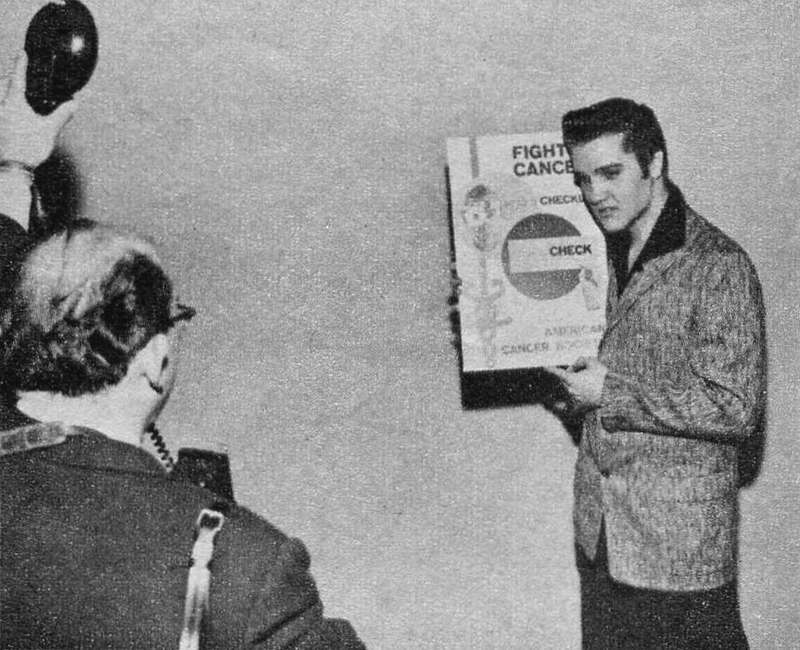 In January 1957, Elvis took another bite of The Big Apple, and he once again found himself in a busy schedule. 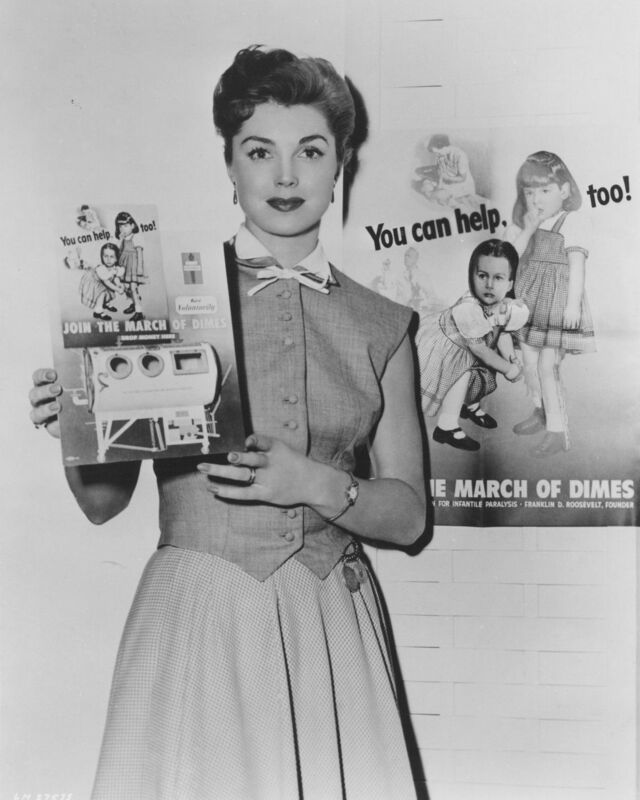 JOANNE WILSON was New York City’s March Of Dimes Poster Girl of 1956. 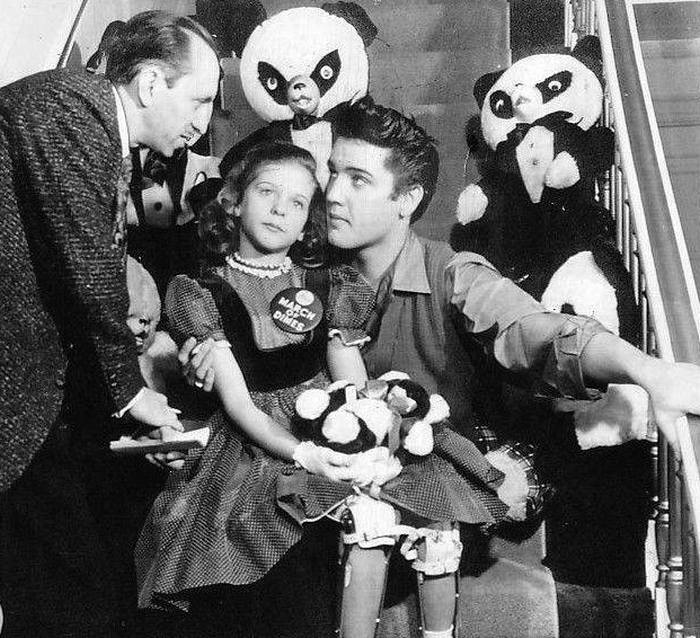 Elvis posed with the lovely Joanne on the day that marked his third and final performance on the Ed Sullivan Show. Elvis is wearing the same clothes as during the Sullivan rehearsals, so these photos seem to be taken around the same time. I have always assumed that only one photo existed of Joanne giving Elvis a kiss. But at closer inspection I noticed that the photo presented below differs from the one to the right (which is the same as the one that was personalized by Joanne). These two photos were taken at just about the same time, but from slightly different angles. Probably by two different photographers. 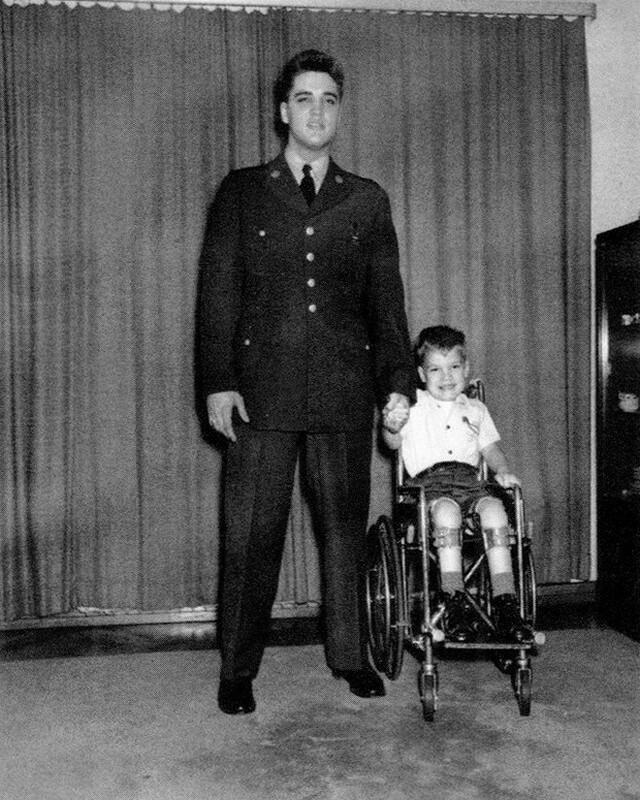 And when we take the direction in which Elvis is looking into account, it would make sense that (at least) a third photographer was present that day. Please see the following entry for an image that includes one of these photographers. 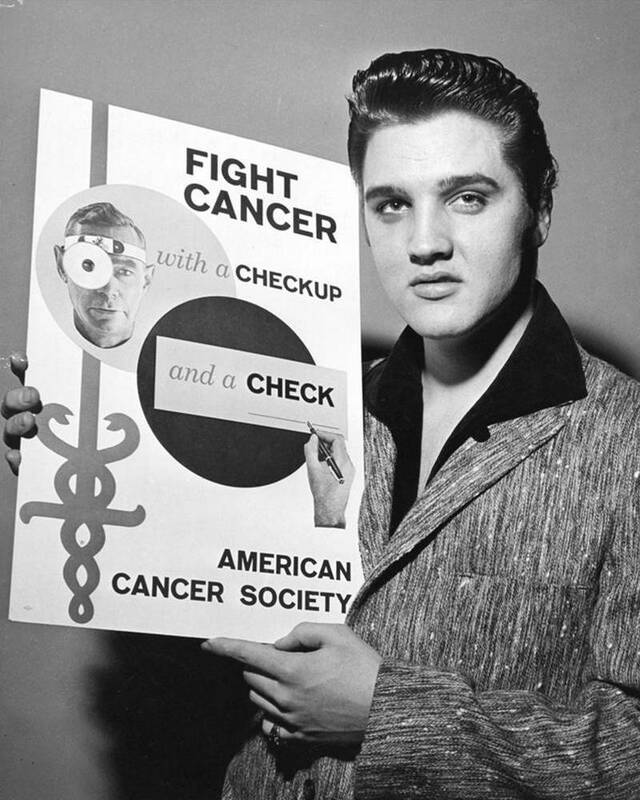 Same day, only moments later, Elvis posed for the AMERICAN CANCER SOCIETY. 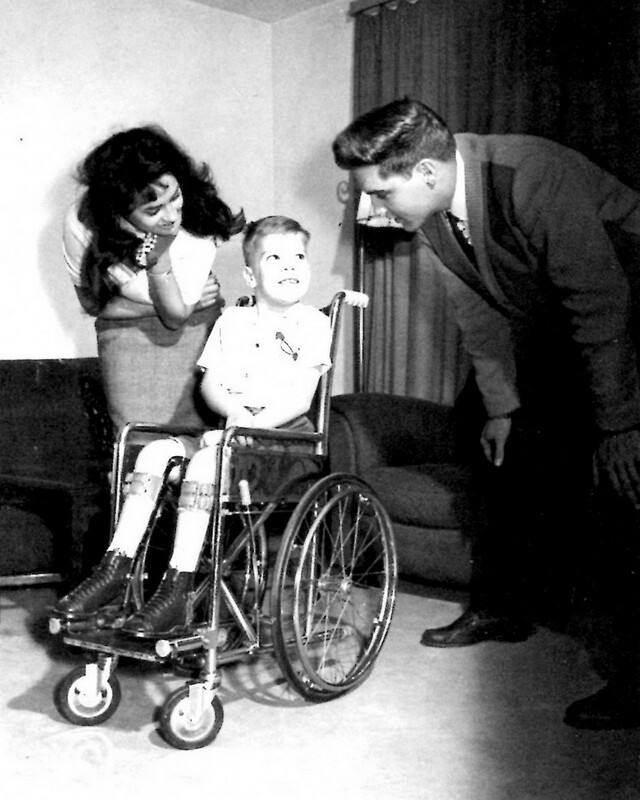 Before Elvis boarded the train to Hollywood, he took the time to pose for some photos with representatives of March Of Dimes. 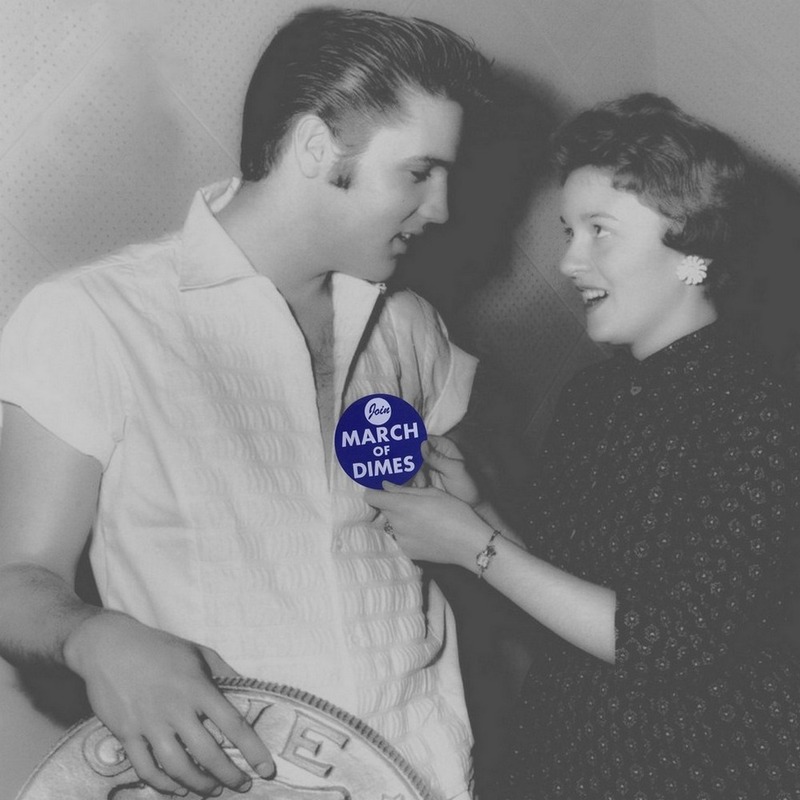 A radio station in Uvalde, Texas offered its collection of Elvis records to the highest bidder, the money would then be donated to March Of Dimes. Sounds good! 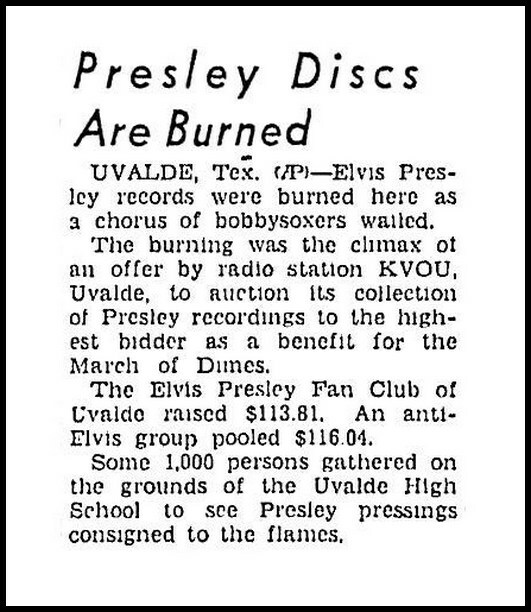 The local Elvis Presley Fan Club got outbid by a group of Elvis-haters who then ritually burned his records on the High School grounds to an audience of a 1000 people! 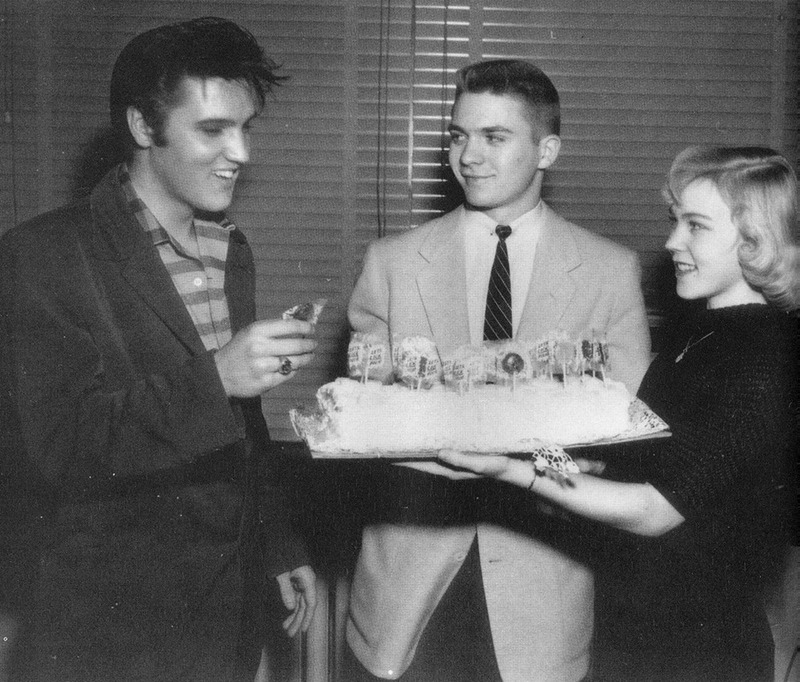 It must have been a small fire because Elvis did not have that many records out by February 1957. 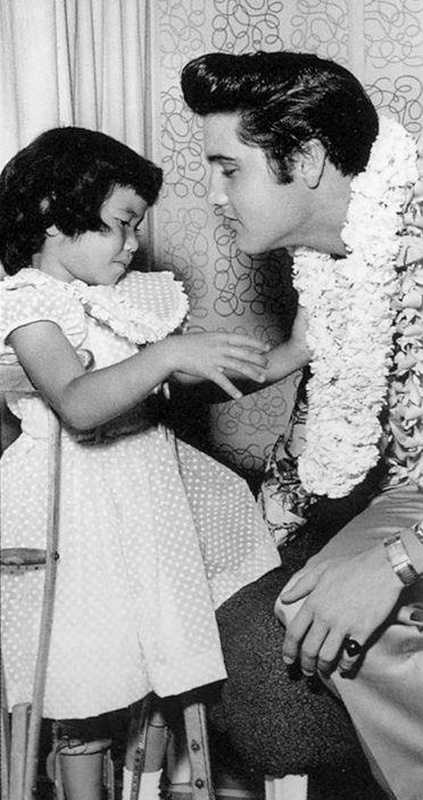 On the photo to the right we can see Elvis having a moment with a young Hawaiian polio victim. 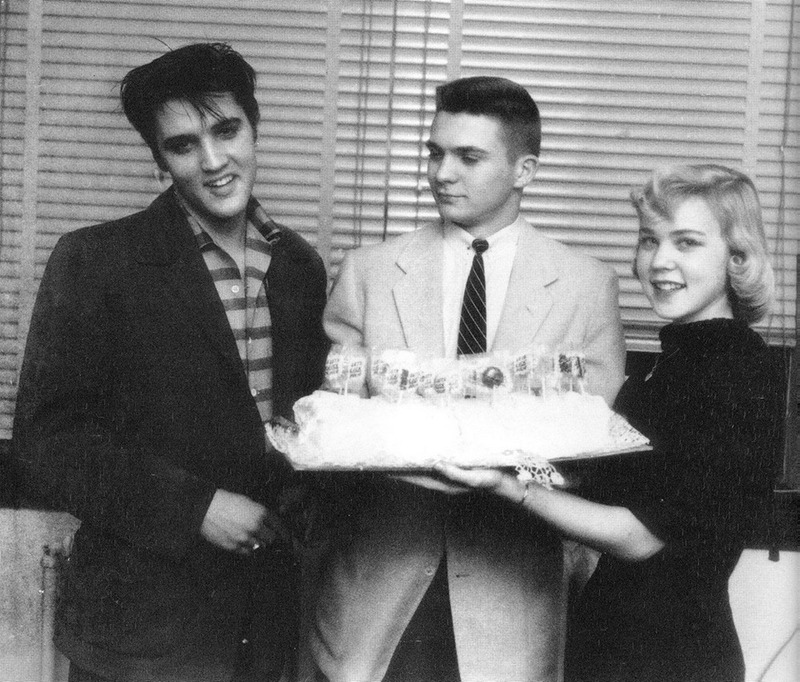 I am not entirely sure about the date, but Elvis is wearing the same clothes as in the picture to the far right, which was taken aboard the S.S. Lurline on the day he left Hawaii, November 13. Just in time for Christmas: a trunkful of stuffed animals. 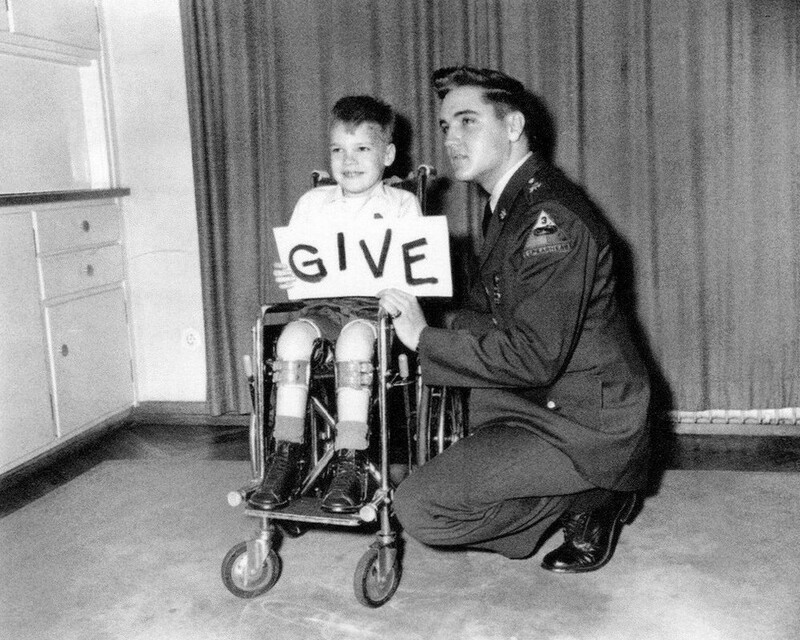 Elvis donated to good causes in just about ever way thinkable. 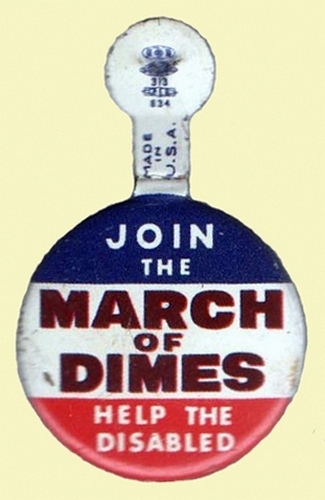 From large sums of money to even a yacht once owned by President Roosevelt. 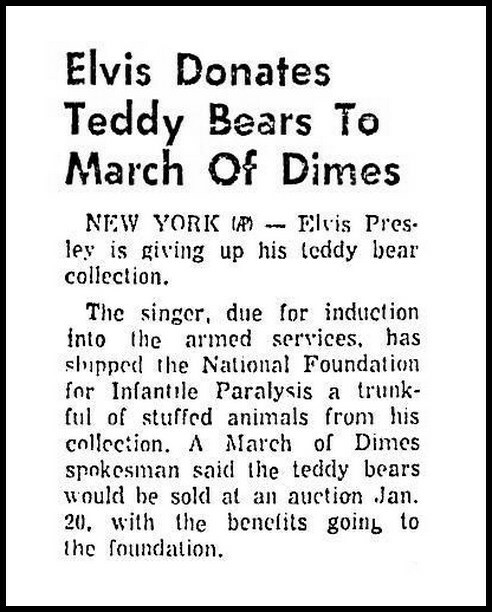 On this occasion Elvis offered March Of Dimes part of his teddy bear collection, to be auctioned on January 20, 1958. 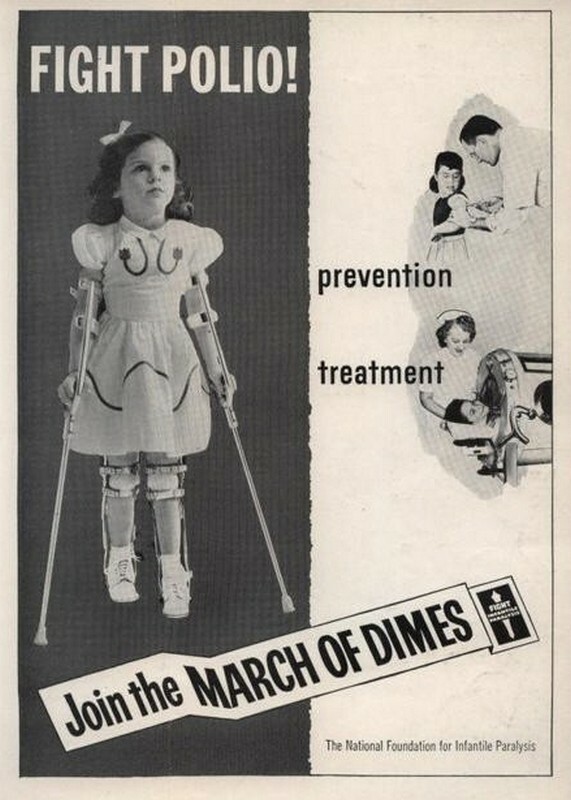 MARY KOSLOSKI was the official March Of Dimes poster-child for 1955. 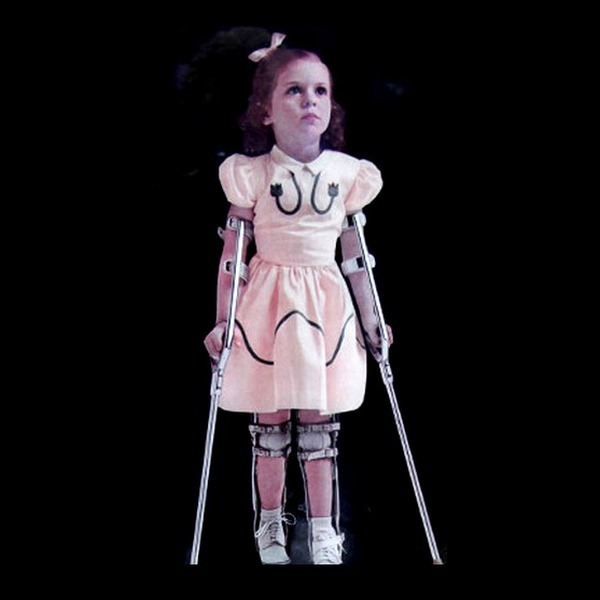 In the photo to the right we see Mary (then 5 years old) with RANDY KERR. 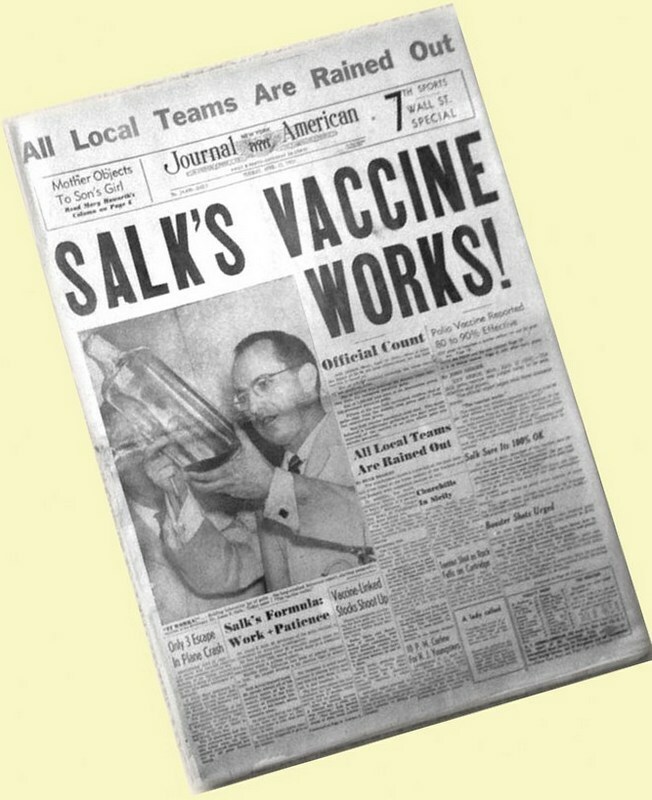 This seven year old boy was the first ever child to receive the Salk Vaccine in 1954. 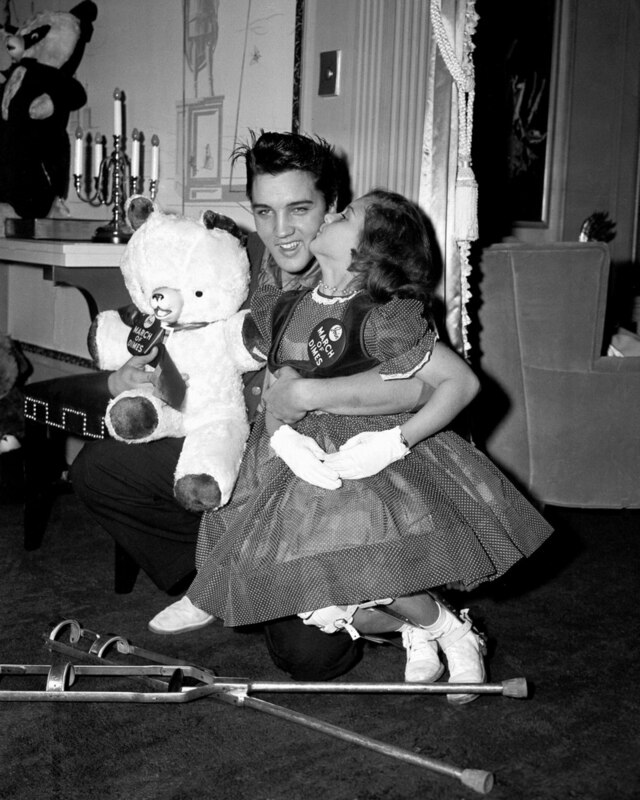 On Elvis’ 23rd birthday, Mary was invited to visit Elvis at Graceland. The photo above has not often been seen. Same goes for the photo to the right. The newspaper article to the right was published in The Tuscaloosa News. 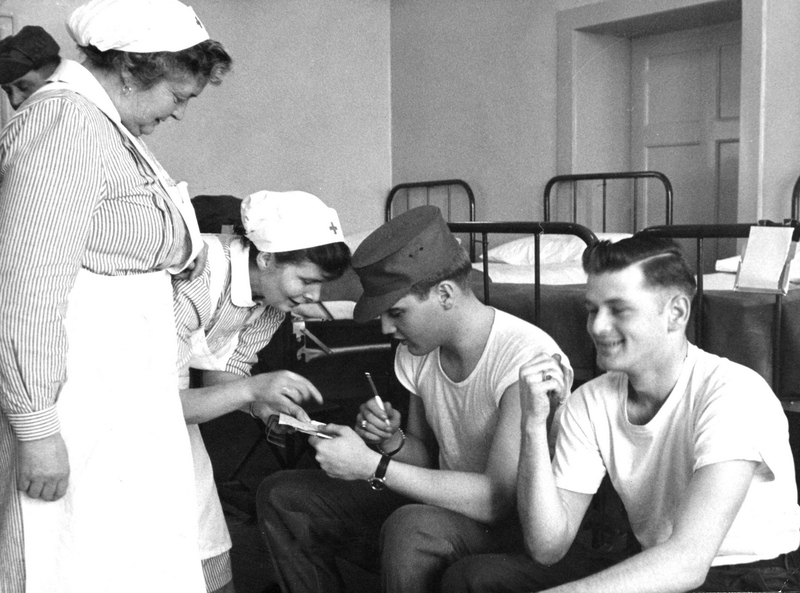 Here we have Elvis visiting ROBERT MARQUETTE in Frankfurt. 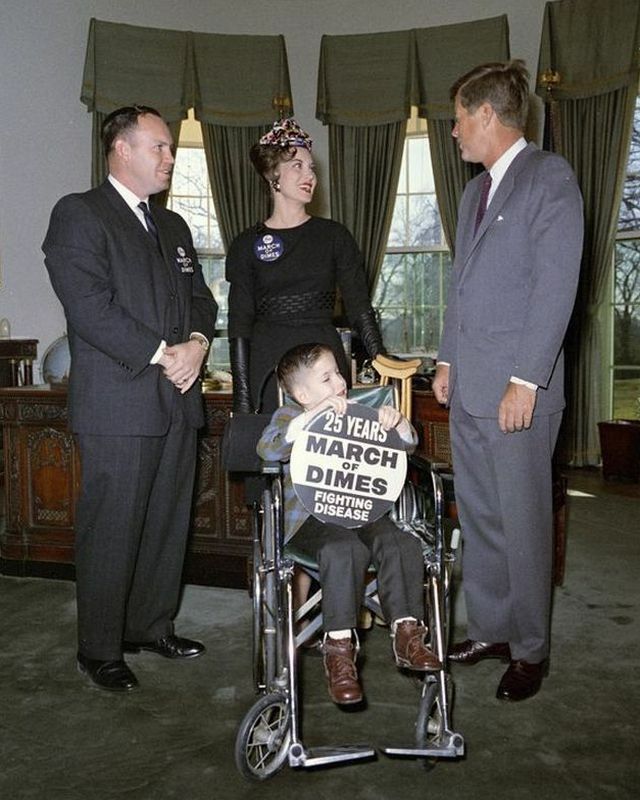 Robert was a six year old March Of Dimes poster child suffering from polio. 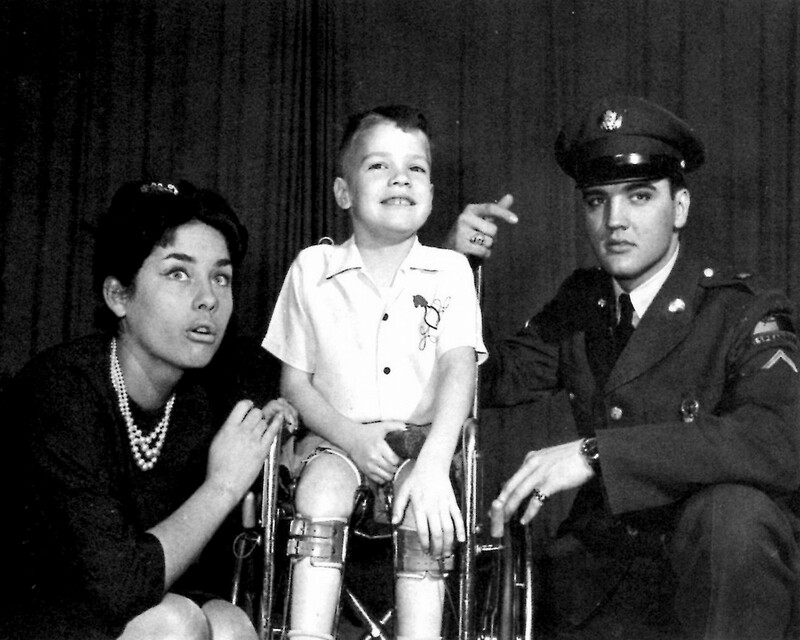 Elvis would pay the Marquette family a visit on at least three occasions. 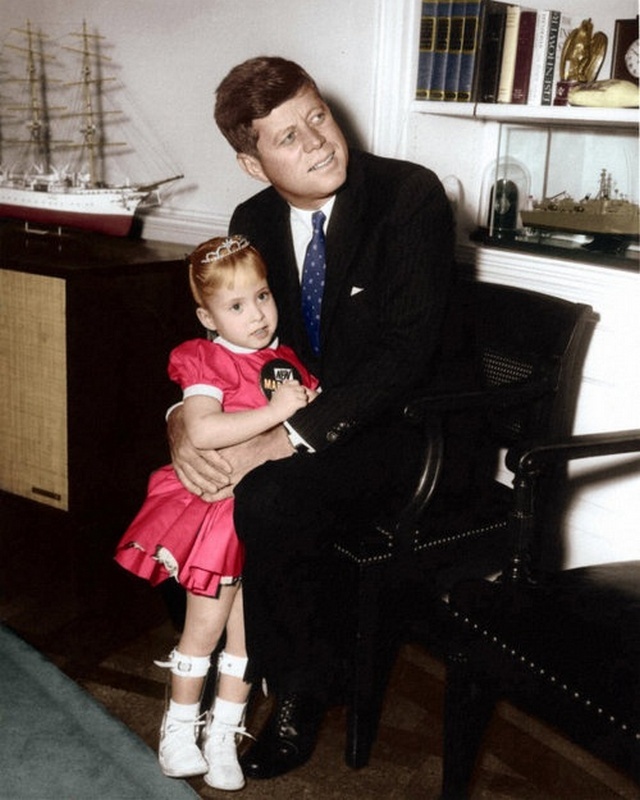 The correct dates for these visits is still a bit of a mystery, but it is generally assumed that the first photoshoot took place in December of 1958. The GIVE sign was clearly improvised and added at the last minute for extra meaning. 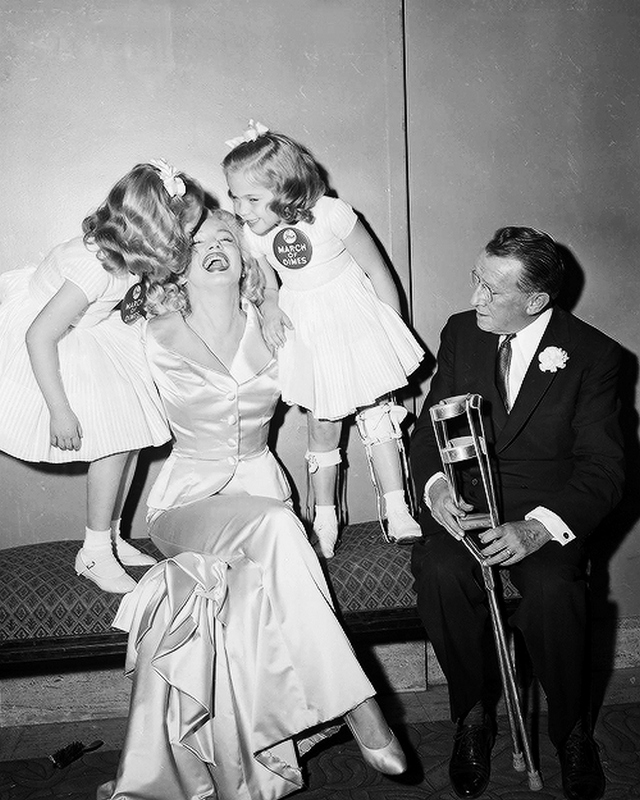 Also notice how Elvis and Robert appear to be looking at different photographers. 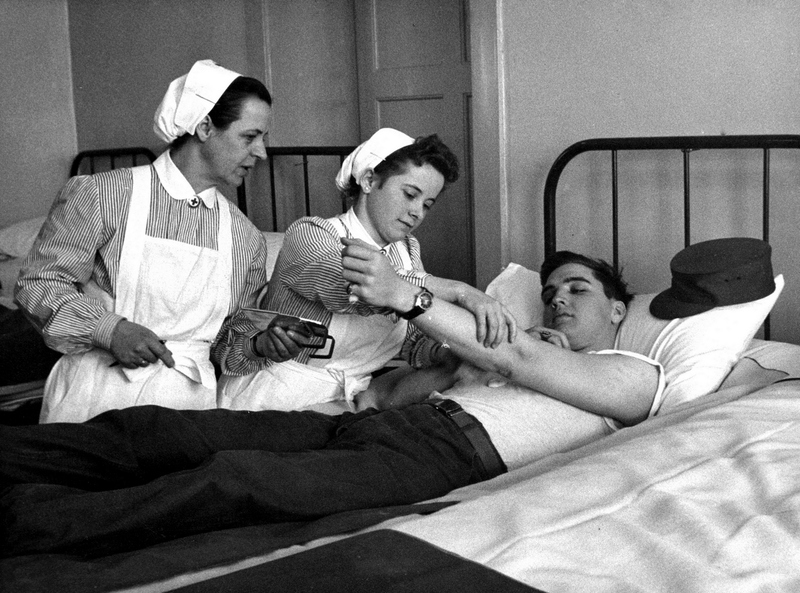 On this day Elvis donated his blood to the German RED CROSS. 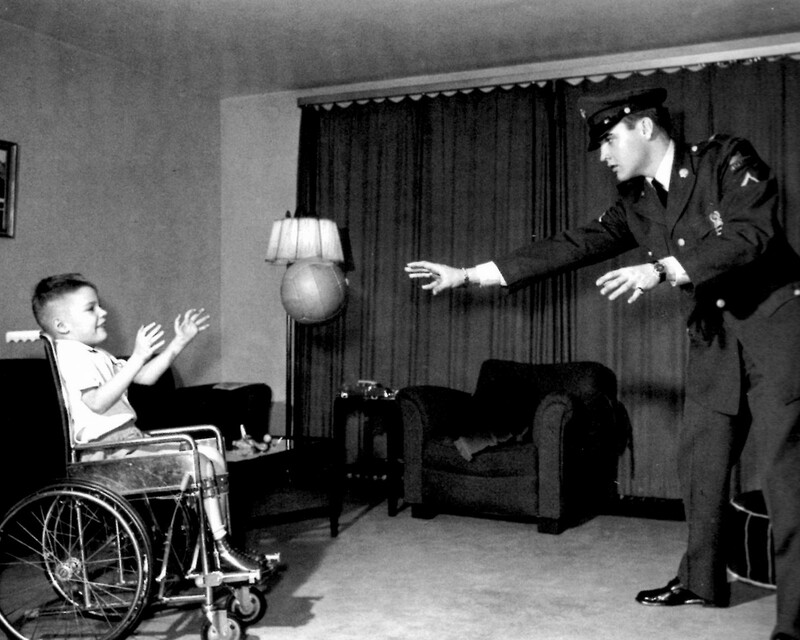 Another photographed event that received media coverage because of it. 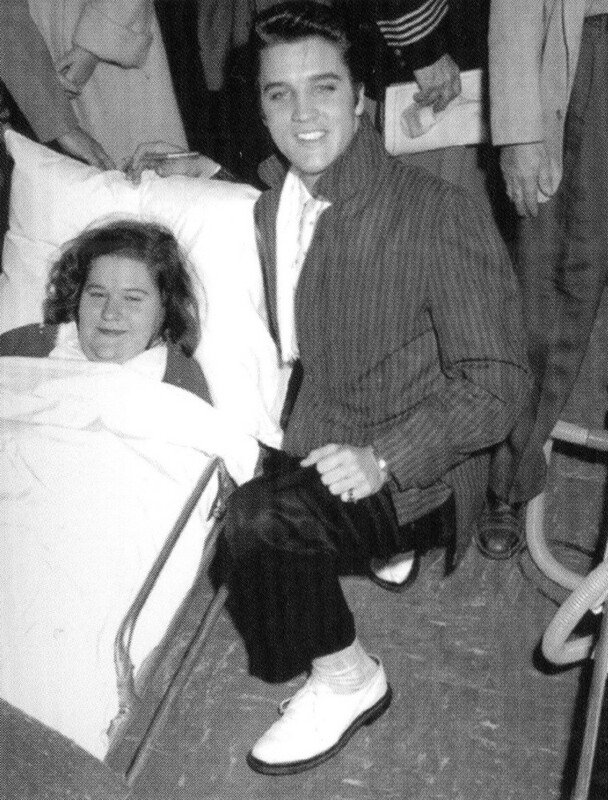 The second time Elvis visited Robert Marquette was in January, and this time Vera Tschechowa was part of the photoshoot. 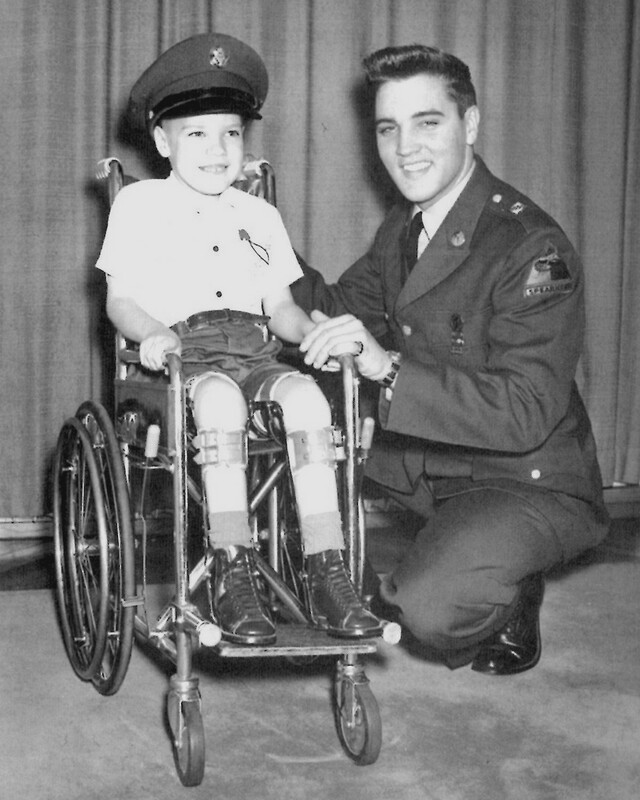 Notice the different uniform Elvis is wearing (compared to the December visit) since by this time he had been promoted to Private 1st Class. 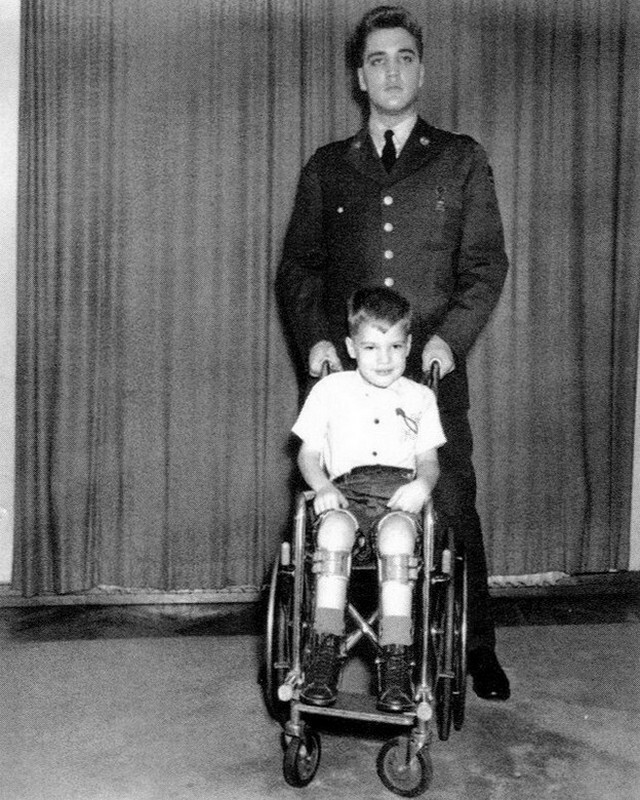 And here we have some photos from another visit, with Elvis in civilian clothes. 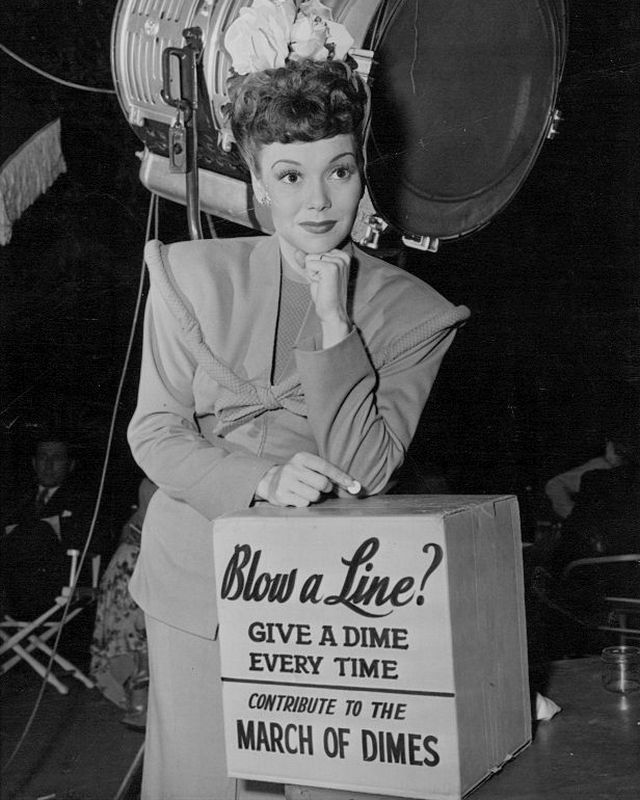 Vera Tschechowa, of course, was part of a publicity scheme. 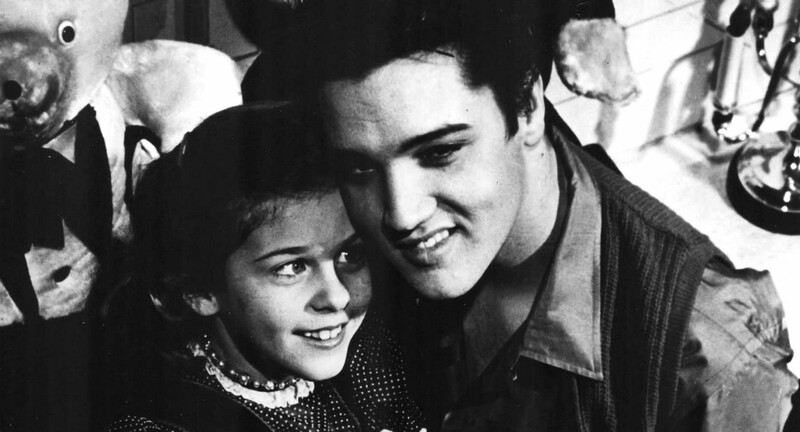 And when looking at the many photos that exist of Elvis with her, the lack of chemistry is evident. 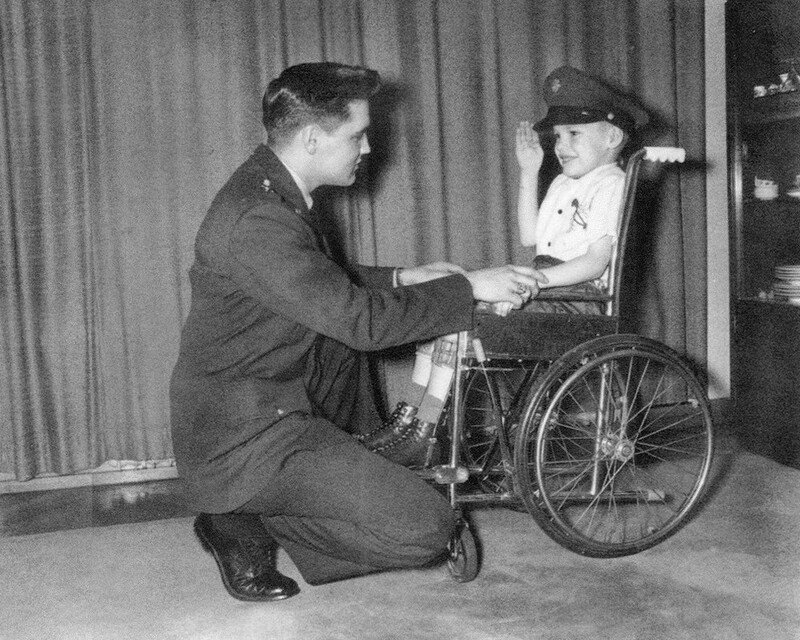 In contrast to Elvis and Vera, in nearly all of the photos of Elvis with young Robert, we can see that these two really enjoyed eachother’s company, which would account for the many visits Elvis paid to the Marquettes during those months. 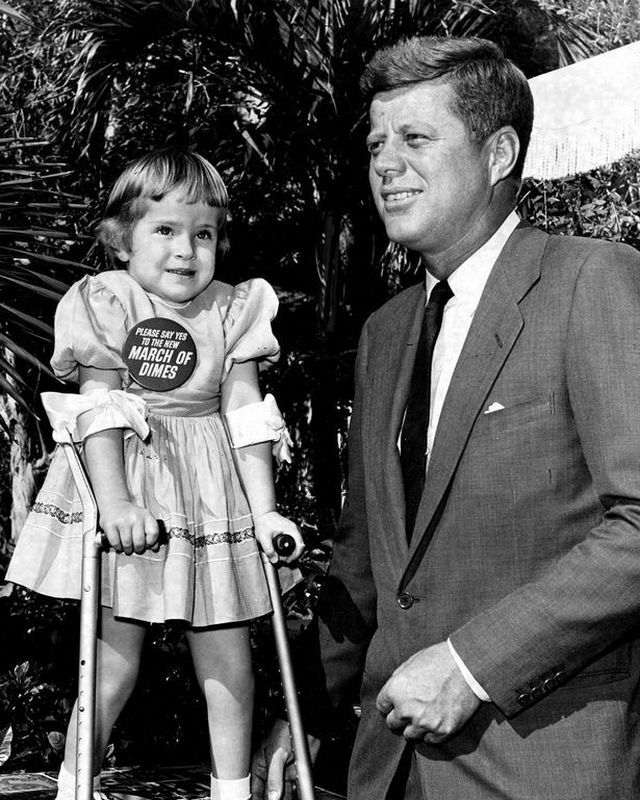 Below that we see President John F. Kennedy, on different occasions during the course of his Presidency, supporting the good cause. 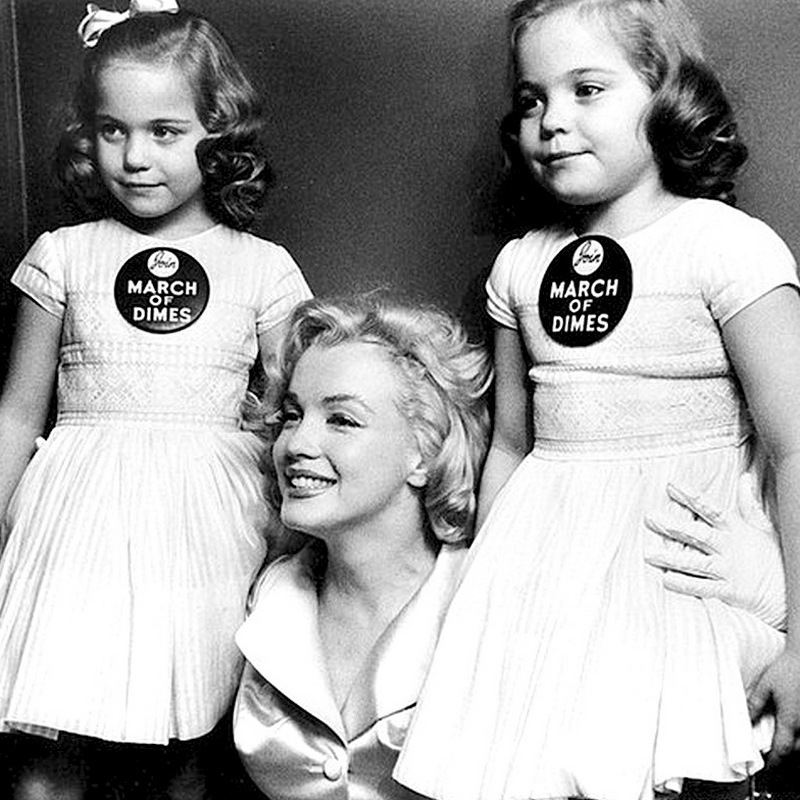 From JFK to Marilyn Monroe is only a small step. 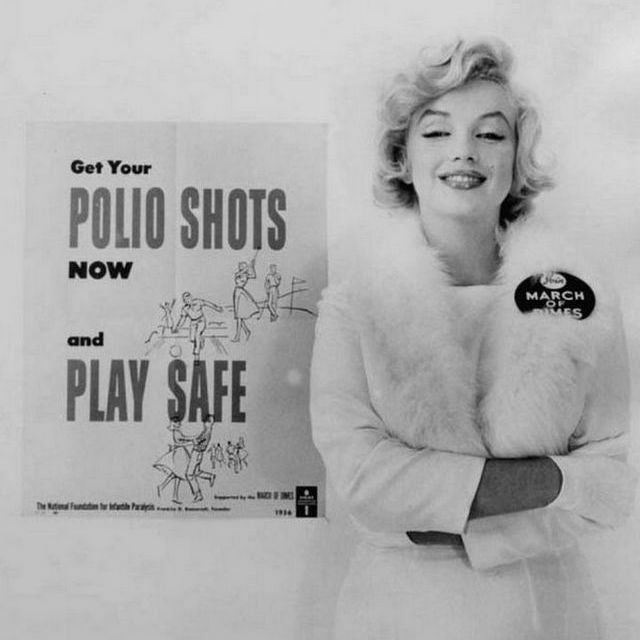 So last but not least we have Norma Jean giving a whole new meaning to the concept of taking a Polio shot with her typical glamourous poses. 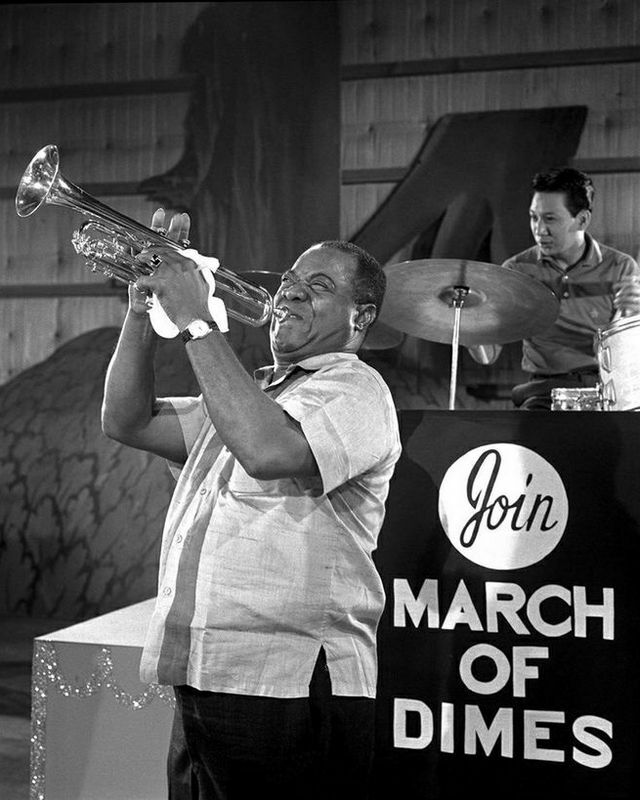 – Thanks to DAVID ENGLISH for the 1957 Miami Daily News article. – A big thank you to ANDY ROTH for allowing me to share some rare images from his wonderful private archive of Frankfurt photos. 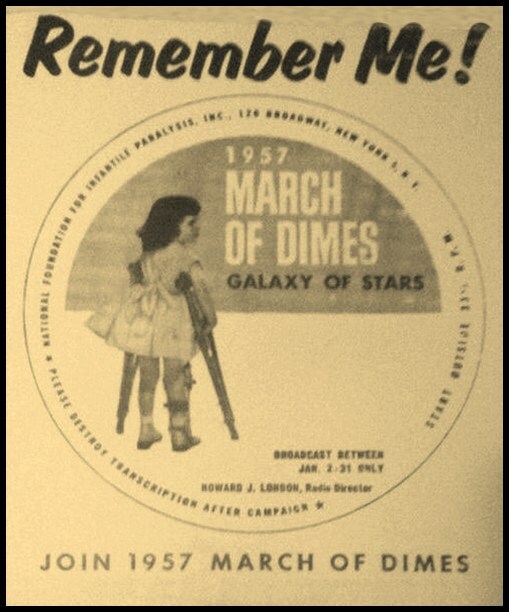 – The Radio Spot of Elvis promoting the 1957 March Of Dimes was officially released on the FTD CD EASTER SPECIAL (2001). 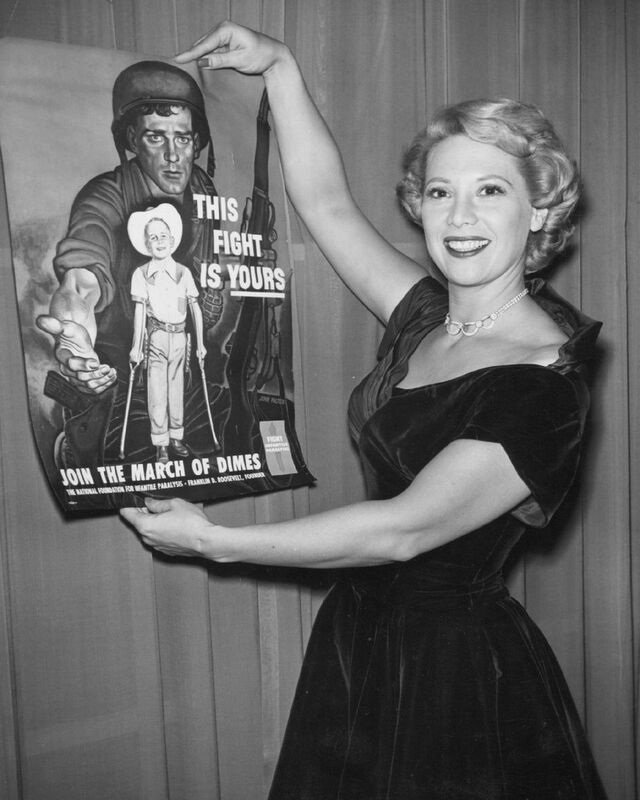 – The photo to the left from December 15, 1956 at the Hayride, was scanned from the MRS CD THE COMPLETE LOUISIANA HAYRIDE ARCHIVES 1954-1956 (2011). 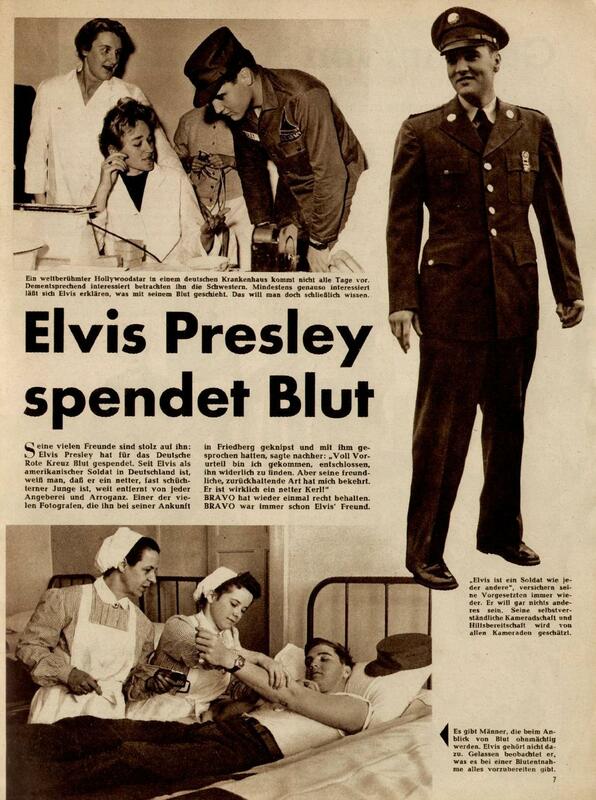 – The “Elvis Presley Spendet Blut” article (January 1959) was scanned from a February 1959 issue of BRAVO magazine. 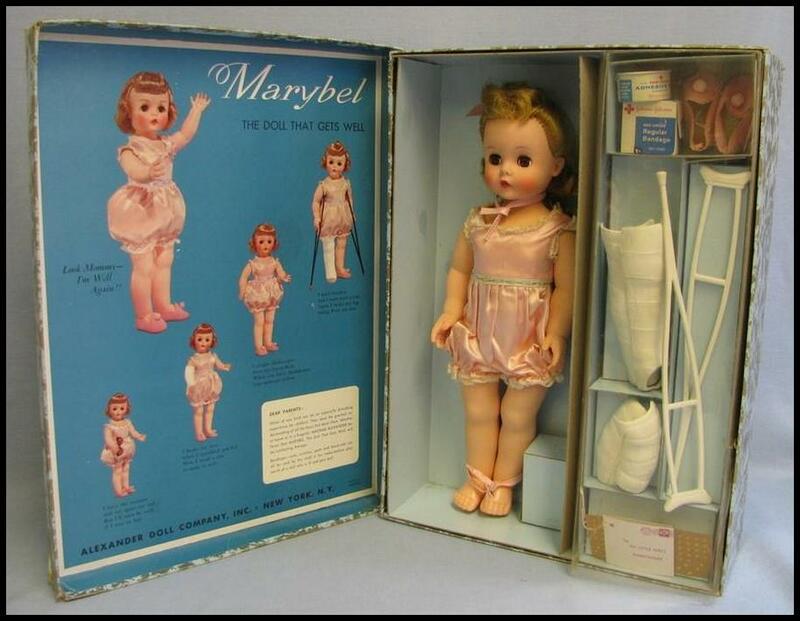 – Credit to Jeremy Riad for the vintage Marybel doll. 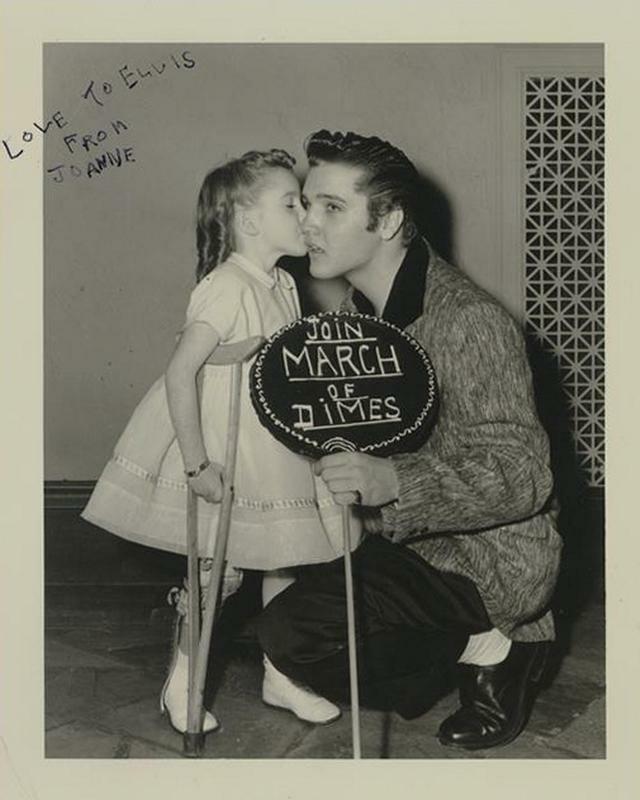 – Visit the ELVIS INFORMATION NETWORK for an INTERVIEW WITH JOANNE KELLY from 2007 about her work for March Of Dimes and meeting Elvis Presley. 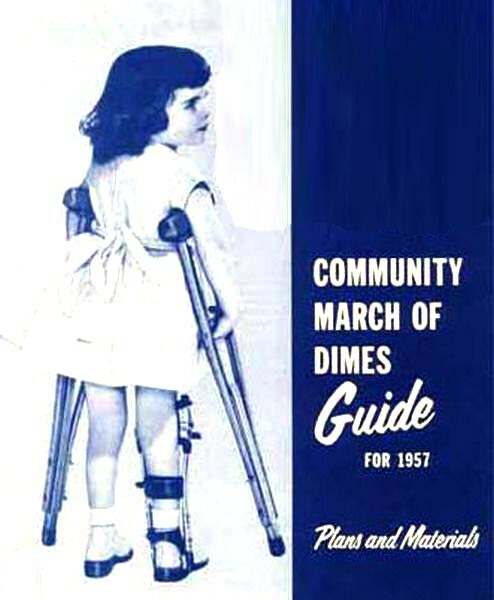 Sadly, the book is no longer available and I do not own this title myself, but hopefully it gets reprinted someday. There are two specific sets of info that are not incuded. 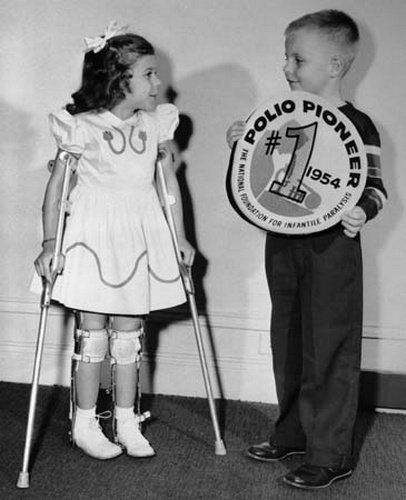 And that was that on October 24, 1956, that press conference where Presley took the third version of Jonas Salks polio vaccine that was shown on national TV with all three channels broadcasting it, the result being the exponential inrease of the immunization levels across the entire United States from 0.6, on the day before, to the 80% reached by April of 1957, when the Salk people announced polio was all but erradicated from the US. 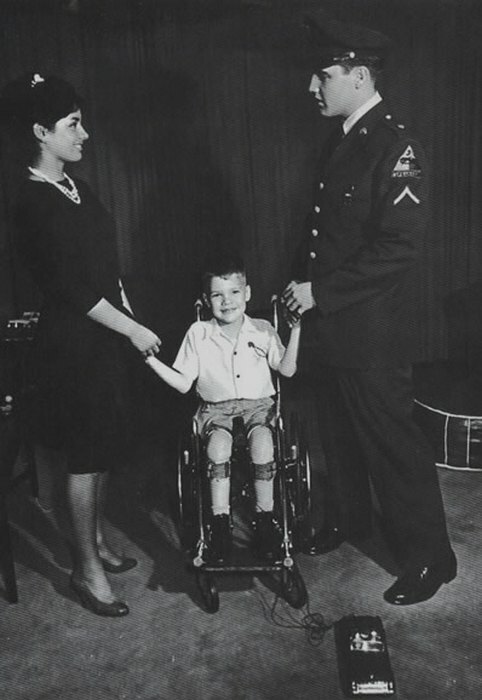 The other item missing was what ALSO tranpired on January 6, 1957, when Sullivan requested, in front of an audience estimated at 50 milllion (the smaller of the three, the first being 62, the second reaching 55 million Americans), on Elvis’ behalf, for his fans to send urgent funds to ease the plight of the thousands of Hungarians fleeing the Soviet invasions, there were two, in succession, which started on 24 October, 1956. 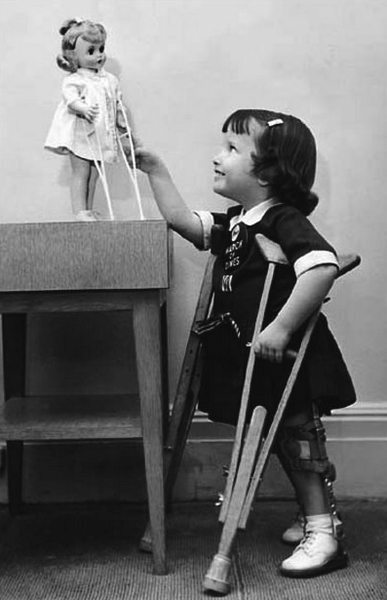 By the end of 1957, some US$6 million, the equivalent of US$50 million in today´s money, had been sent with the International Red Cross in Geneva being resposnsible for its distribution, in persihables like food rations, and nonperishables, to the thousands of families which thanks to this initiative, were able to be settled out of harm´s way, in London and Vienna. The non operishables ranouit in the year 2000!! As a show of gratitude, the Mayor of Budapest named Evis posthumously, in 2011, a citizen of that beautiful city, as well as a Park facing the city´s oldest and most awesome bridge, the Margarte bridge, after him. 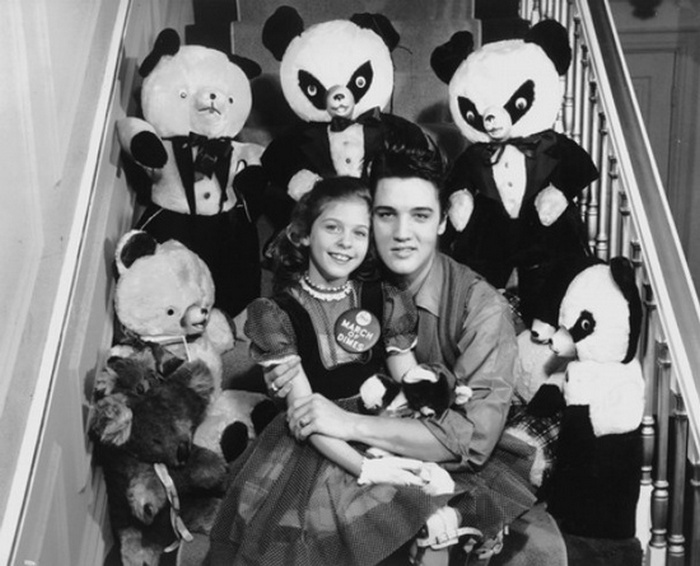 Elvis Presley Park. Yet another great thread Bob, love these pages. Always a pleasure to read and view your articles. Superb Bob. Really enjoyed this. 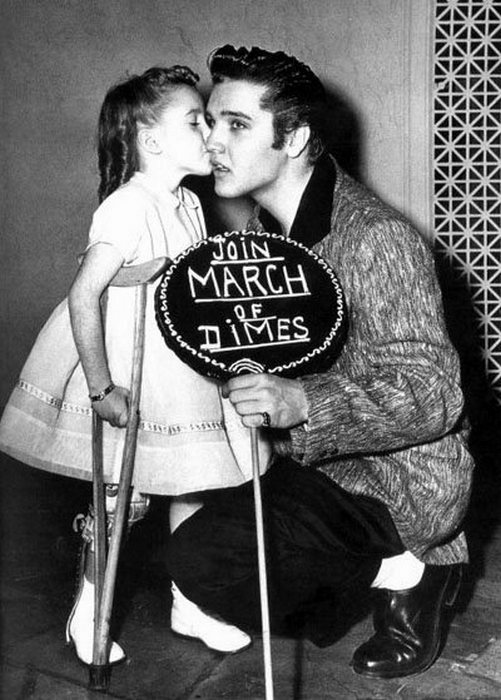 More of this side of Elvis should be known. He was like this right up until his passing. 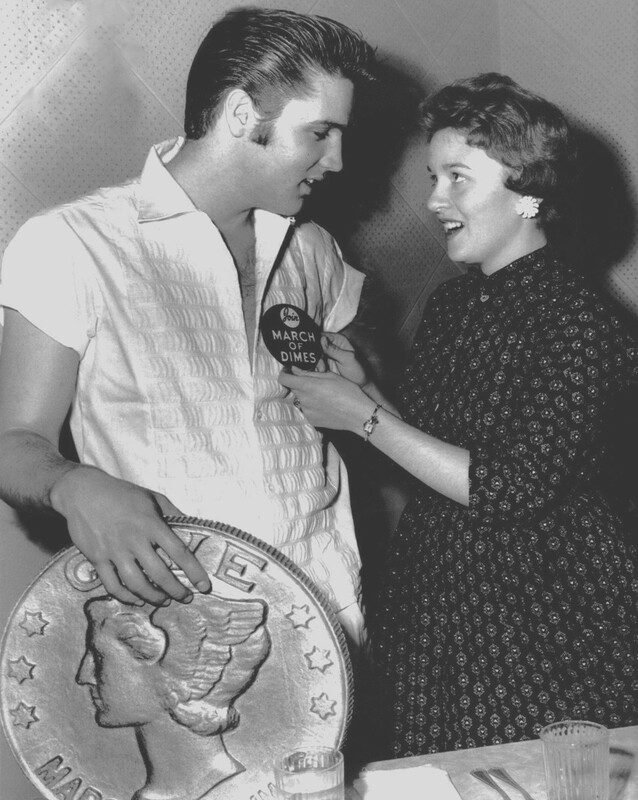 Many Memphis organisations were given large cheques (checks) at Christmas time. 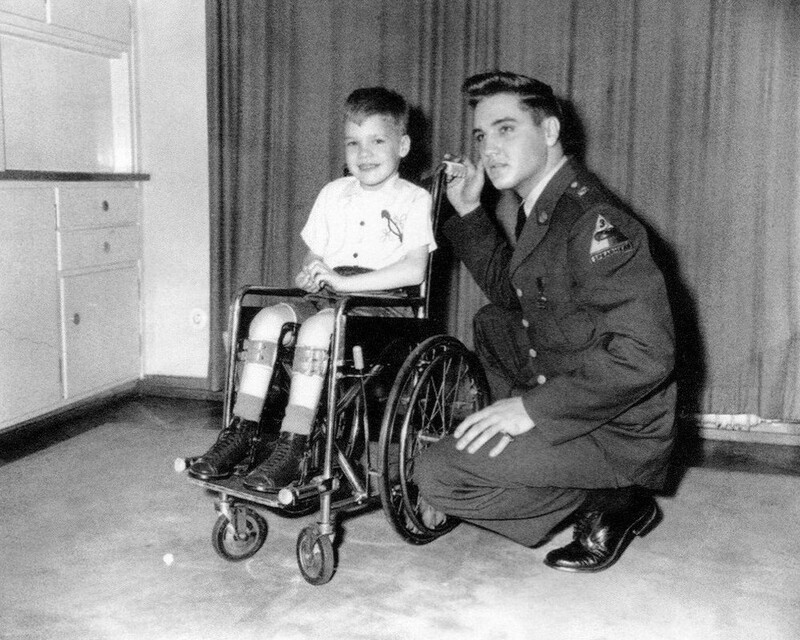 Countless times Elvis met people down on there luck and gave them financial help. Also did this to many of the people that worked for him. He is a true icon. This man who people call the greatest entertainer ? Oh so so very true ! But my God he had a heart ! 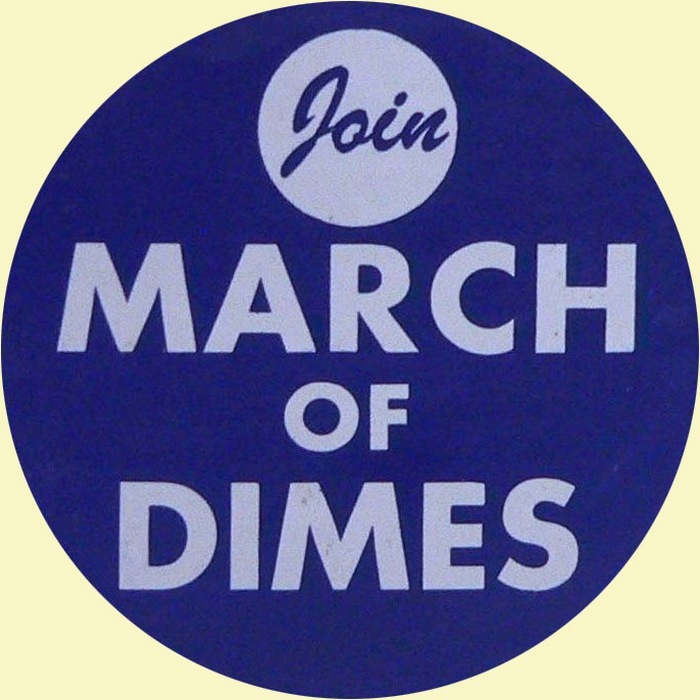 From March of dimes too the ship the Arizona ! 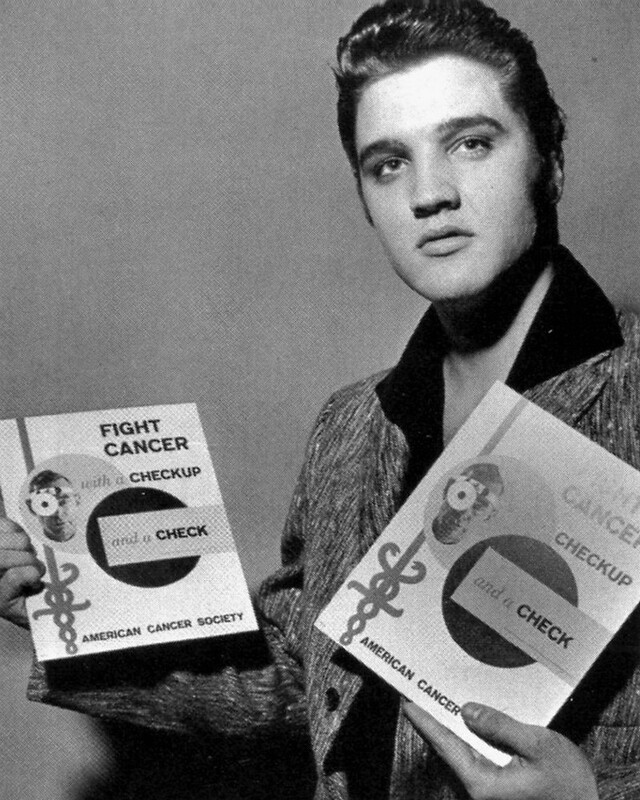 And all of the charities Elvis was involved in for twenty years folks say he only did it for tax relief. So so wrong ! He came from the poor side of town and never forgot that fact ! Do you see any one compare to his act’s of kindness today ? Died alone and for that I’ll always remember the great acts of kindness he did for so many !